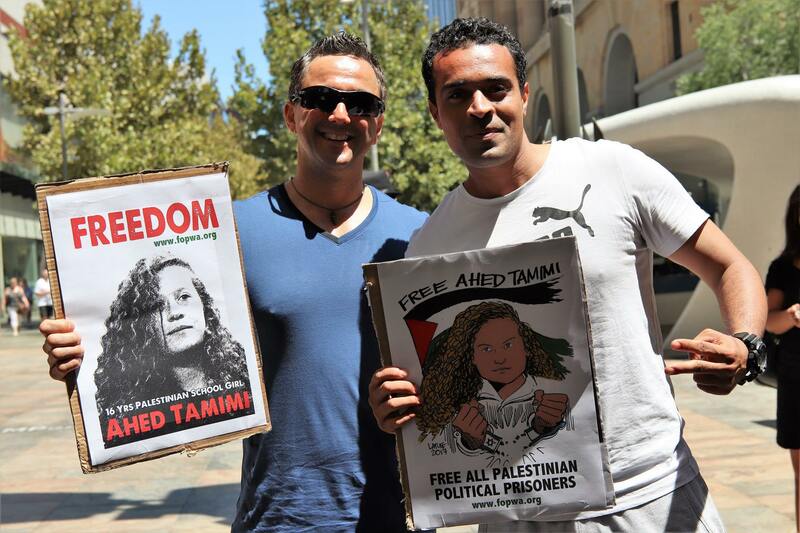 Protests and actions around the world marked the 17th birthday of imprisoned Palestinian teen activist Ahed Tamimi. 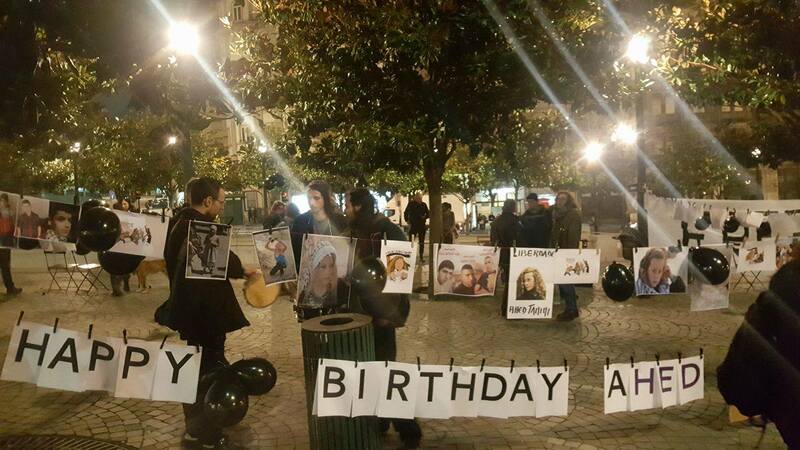 With birthday songs, cakes and cards as well as strong, powerful protest actions against Israeli occupation and colonization, the streets of international cities marked days of action called for by Samidoun, the Free the Tamimi Women campaign and other organizations to demand the release of Ahed, imprisoned since 19 December and facing charges before an Israeli military court. Ahed, 17, was seized by occupation forces in a pre-dawn raid on her family’s home in the Palestinian village of Nabi Saleh, near Ramallah, where she and her family are leaders in the anti-colonial indigenous land defense and resistance movement. The village’s land and even its spring have been confiscated by the illegal colonial settlement of Halamish and the village is regularly subject to invasions, raids and arrests. Ahed’s mother, Nariman, a strong activist in her own right, was arrested by occupation forces later the same day. Ahed’s confrontation with occupation forces invading her family’s land, in which she slapped a heavily armed occupation soldier seeking to use the land to repress a demonstration in the village, was video recorded live and streamed on Facebook; Ahed and her family were already well-known in Palestine and internationally for their role in years of organizing in their village. 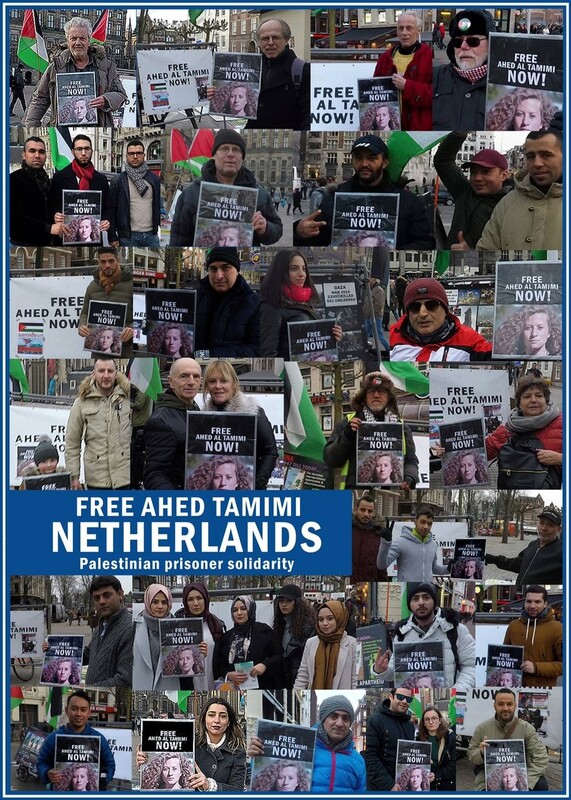 The abduction of Ahed Tamimi and her mother by occupation forces has sparked worldwide and widespread solidarity, and she has become a young symbol of Palestinian resistance. She is one of over 350 Palestinian children imprisoned by the Israeli occupation and one of nearly 6,200 Palestinian political prisoners in Israeli jails. 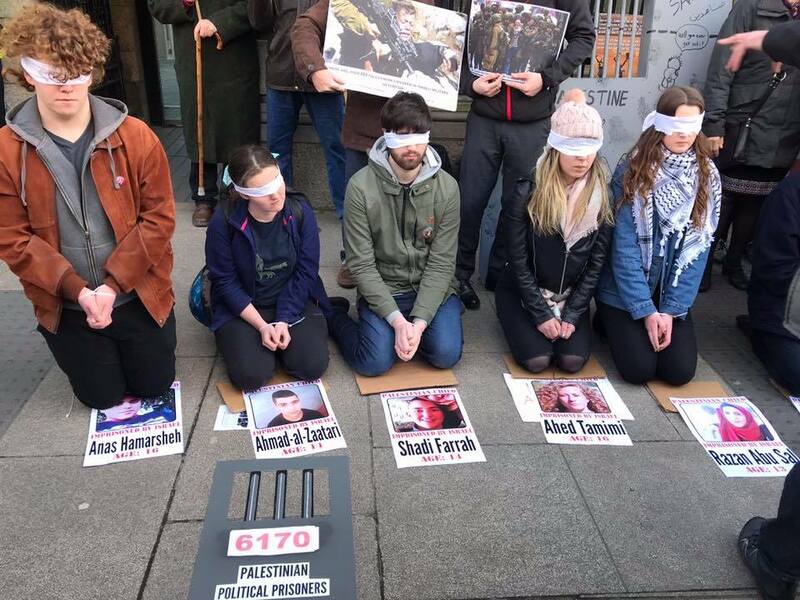 Each year, around 700 Palestinian children are brought before Israeli military courts, and 25 Palestinian children have been subject to administrative detention – imprisonment without charge or trial – over the past two years. 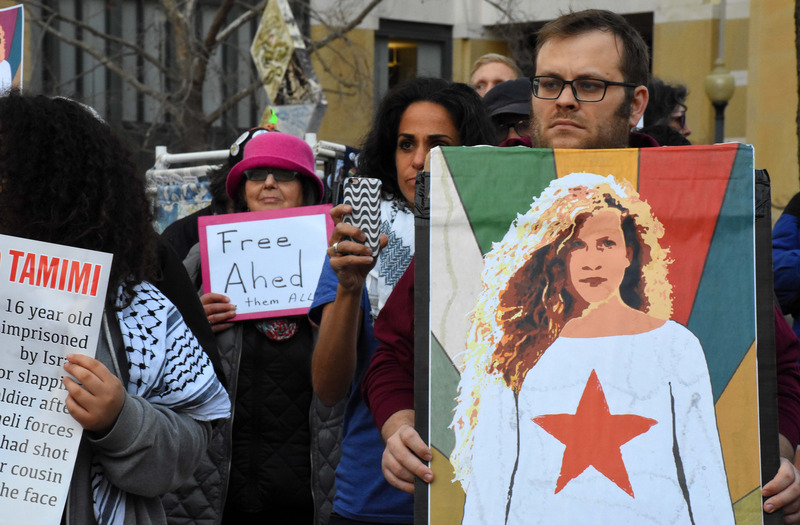 Ahed’s 17th birthday inspired a call for days of action around the world – for her freedom, the freedom of all Palestinian prisoners, and the freedom of the land and people of Palestine. 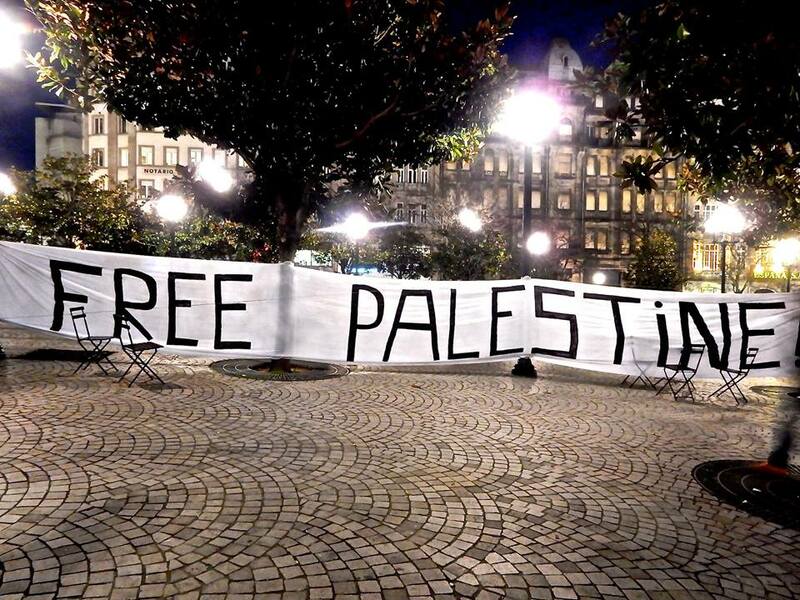 The actions are continuing in the coming days, with weekend actions in cities throughout New Zealand; Antwerp, Belgium; Fort Lauderdale, FL; Clermont-Ferrand, France; al-Khalil, Palestine and elsewhere, leading up to the next military court hearing for Ahed and Nariman Tamimi on 6 February and ongoing until Ahed – and Palestine – is free. 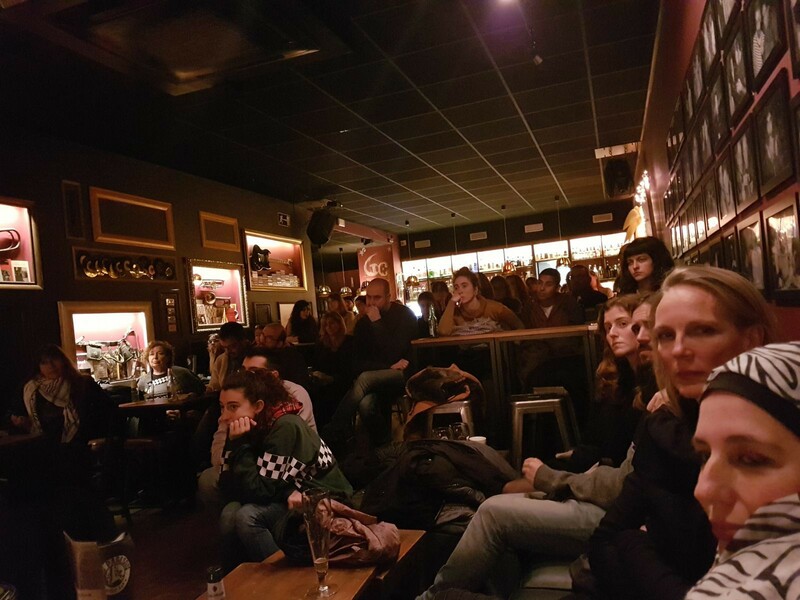 Unadikum Catalonia hosted several screenings of the film, “Radiance of Resistance,” focusing on the lives and struggles of Ahed and her younger cousin, Janna Jihad Ayyad, in San Feliu de Llobregat and Barcelona. on 26 and 27 February. 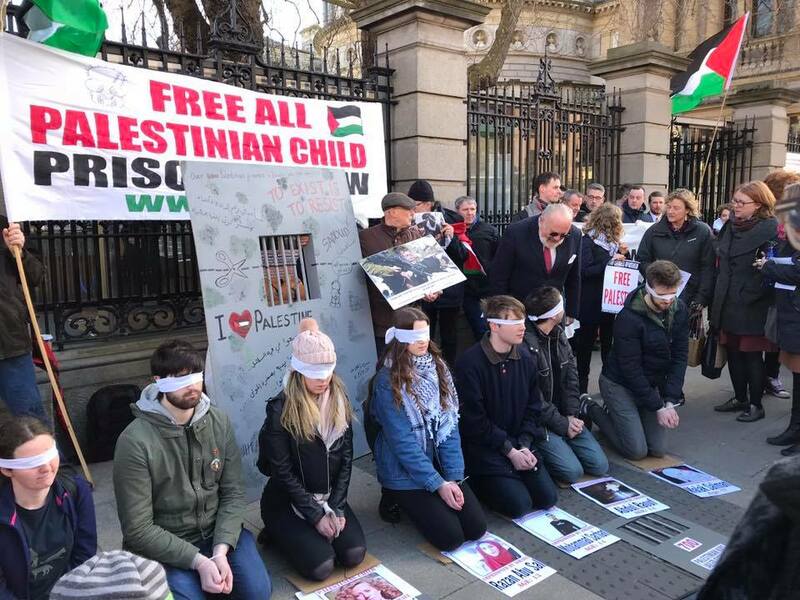 On 25 January, the Ireland Palestine Solidarity Campaign (IPSC) organized a protest outside the Dail Eireann – the Irish Parliament – demanding freedom for Ahed Tamimi as she turns 17 inside Israeli prison. 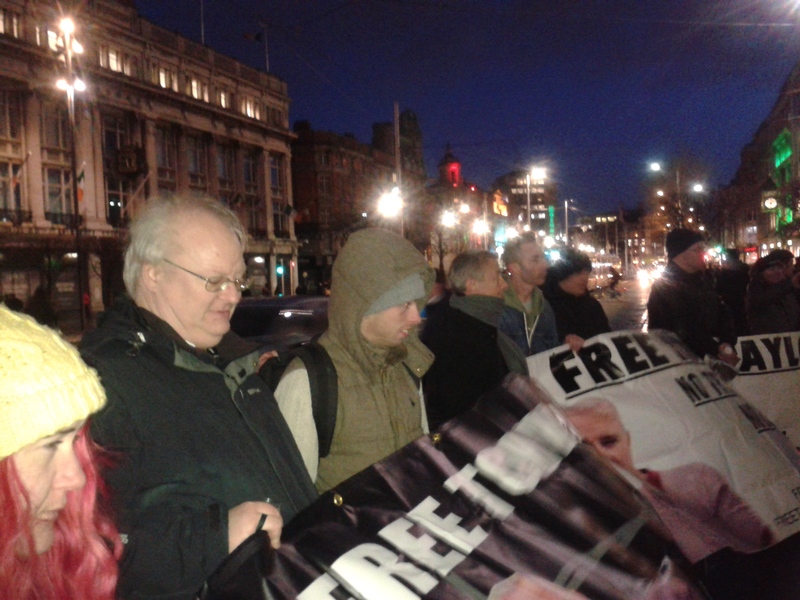 “The protest was well attended with many members of the Irish parliament attending including TDs Dessie Ellis, Maureen O’Sullivan, Pat Buckley, Richard Boyd Barret, Gino Kenny, Paul Murphy, Aengus Ó Snodaigh, Maurice Quinlivan, John Brady and Joan Collins, and Senators David Norris, Padraig MacLochlainn, Alice Mary Higgins, Niall Ó Donnghaile and Grace O’Sullivan. 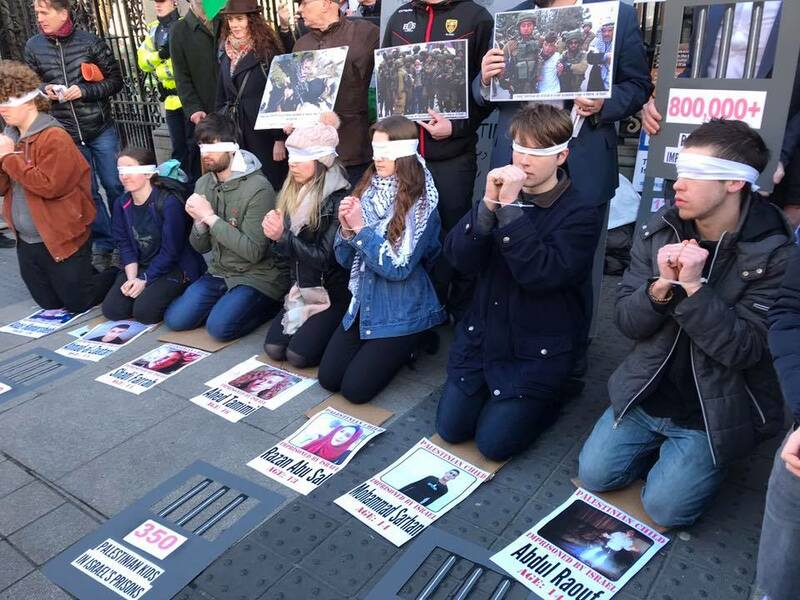 Ibrahim Halawa, the Irish citizen was arrested aged 17 and spent four years in an Egyptian prison, also attended,” noted the IPSC. 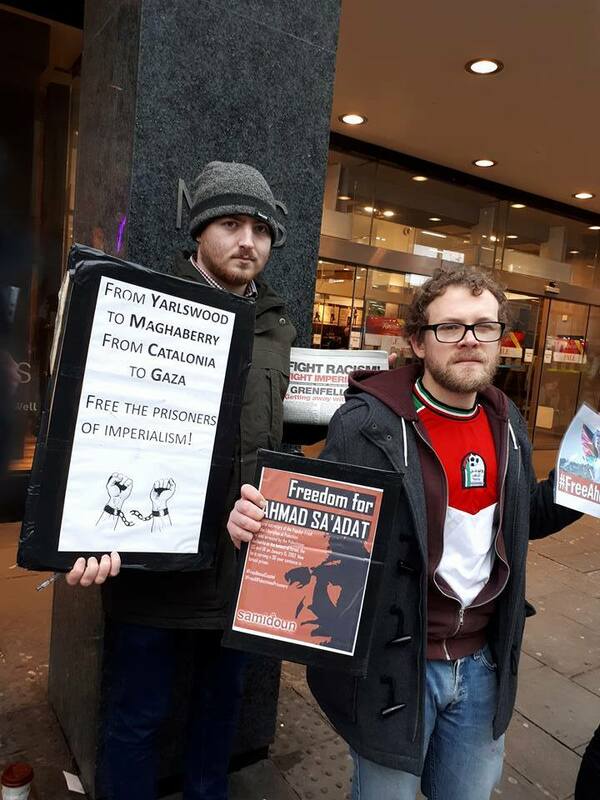 On 31 January, Ahed’s birthday, the struggle of Ahed and her fellow Palestinian political prisoners – and the Palestinian people – was featured as part of a “Bloody Sundays” protest by Anti-Imperialist Action Ireland. 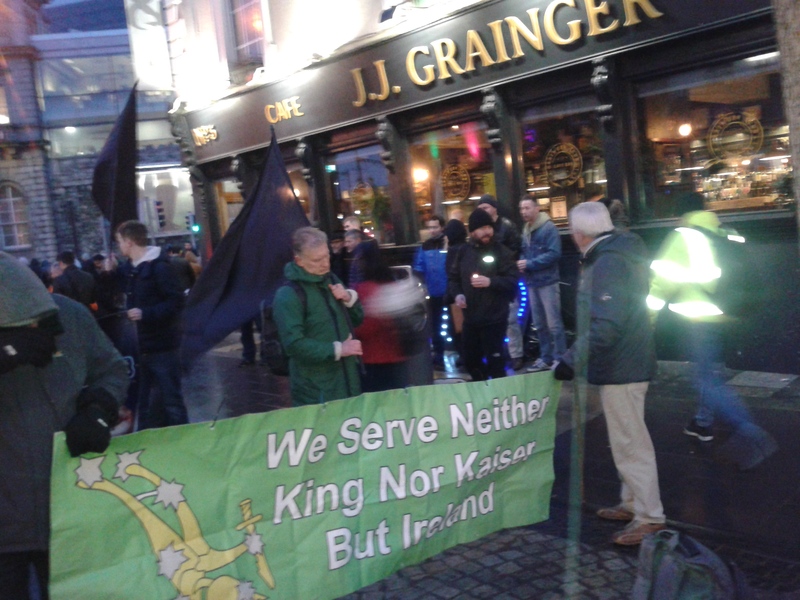 Approximately 100 people participated in the event, highlighting “ongoing Imperialist war crimes in Ireland and around the world..It was attended by a broad range of progressive forces including Irish Socialist Republicans, The Independent Workers Union, Saoradh, The Irish Republican Socialist Party, The 1916 Societies, the Anti Internment Group of Ireland and the Free Tony Taylor Dublin Committee as well as Independent Activists and other progressives,” noted the organizers. 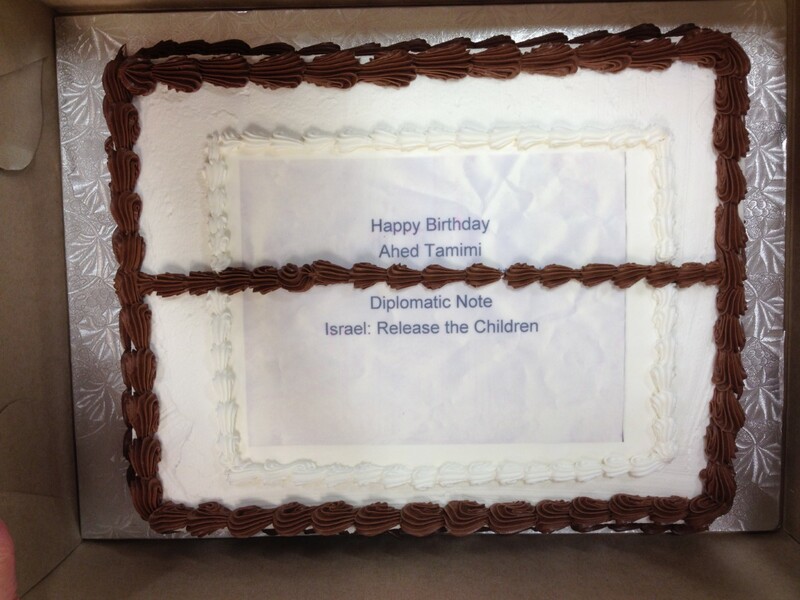 The event included a collective “Happy Birthday” song for Ahed. 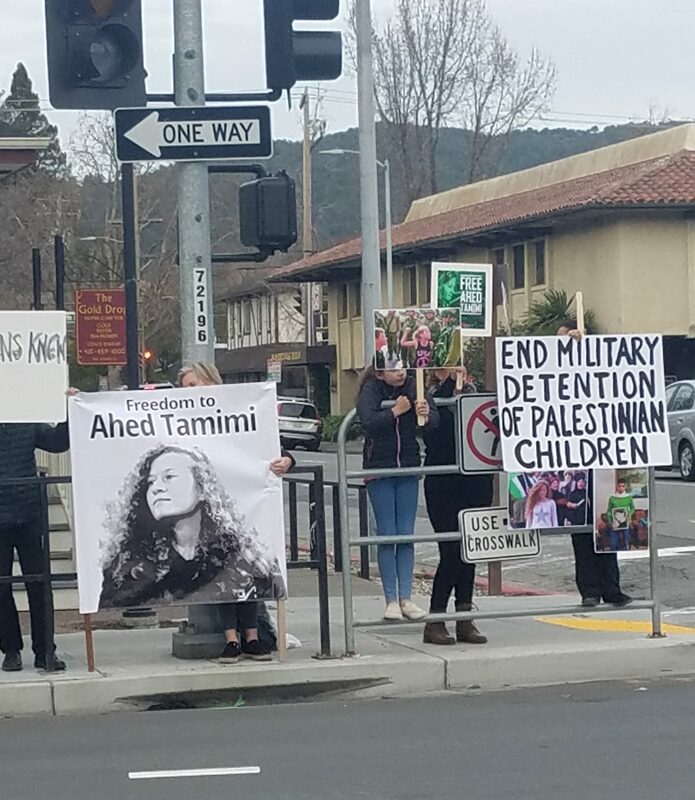 Activists in San Rafael in California’s Marin County gathered on 26 January to call for freedom for Ahed and her fellow child prisoners in Israeli jails. 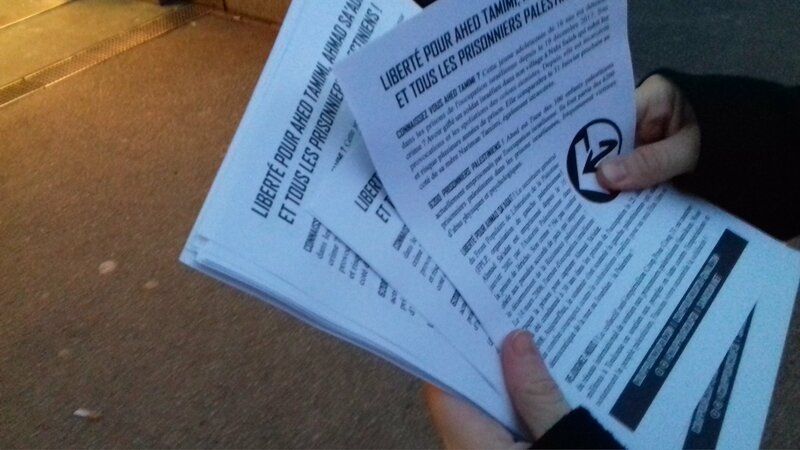 15 people joined the protest where they distributed hundreds of flyers to nearby drivers. 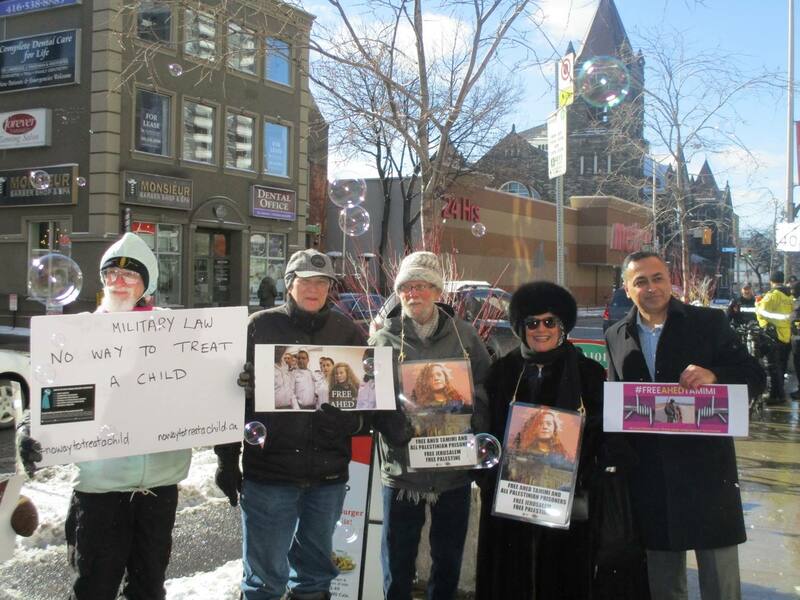 They urged people to contact their member of Congress to support HR 4391, the Promoting Human Rights by Ending Israeli Military Detention of Palestinian Children Act. 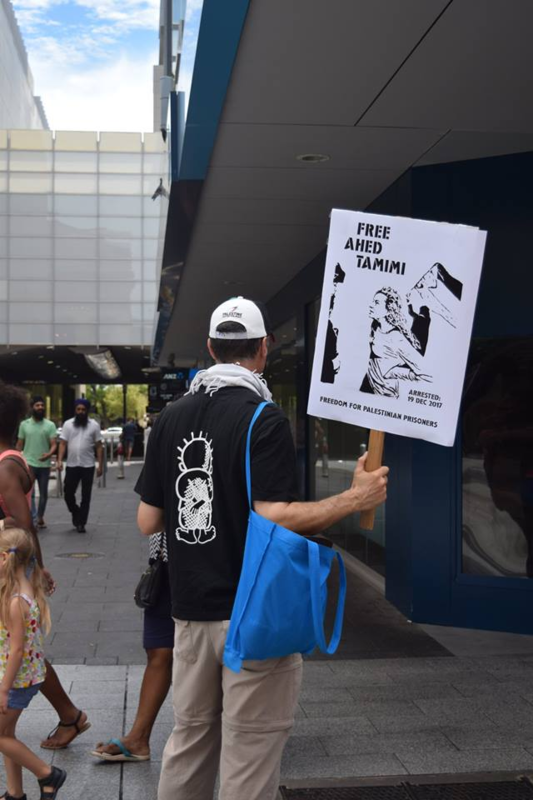 Friends of Palestine Western Australia (FOPWA) organized a protest on Saturday, 27 January at the Murray Street Mall in Perth, calling for freedom for Ahed and all Palestinian prisoners in Israeli jails. 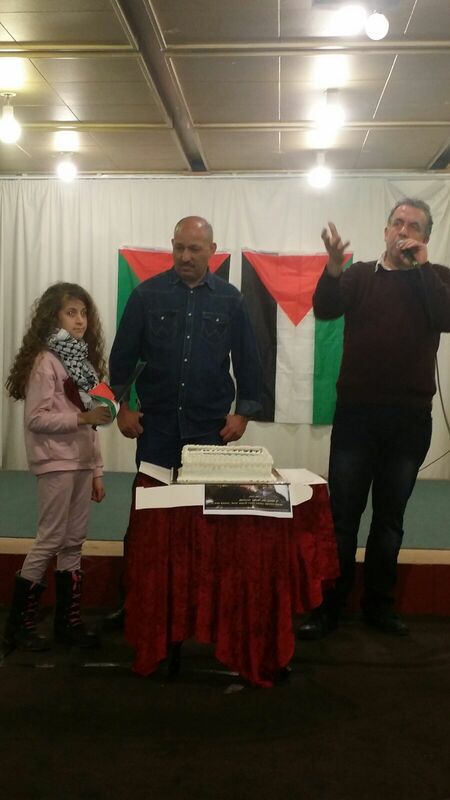 They distributed leaflets and organized solidarity images greeting Ahed on her birthday. 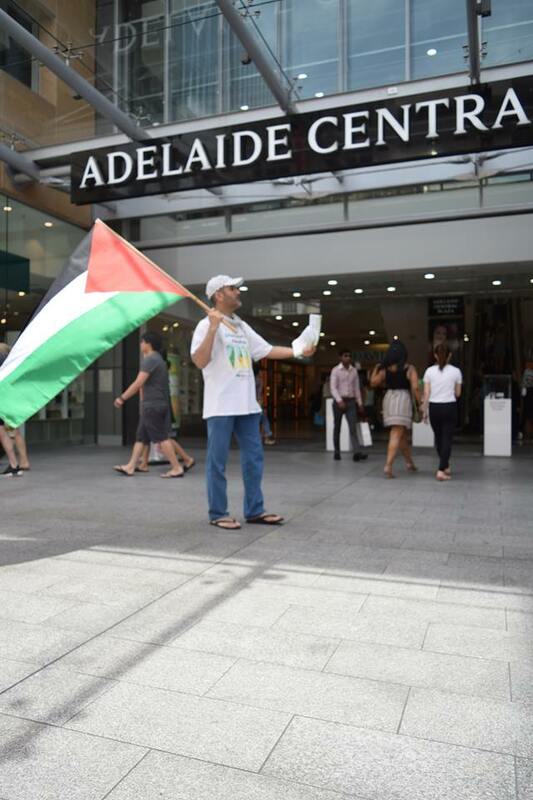 Australian Friends of Palestine Association held their 373rd protest on 27 January, which they dedicated to Ahed in advance of her birthday. 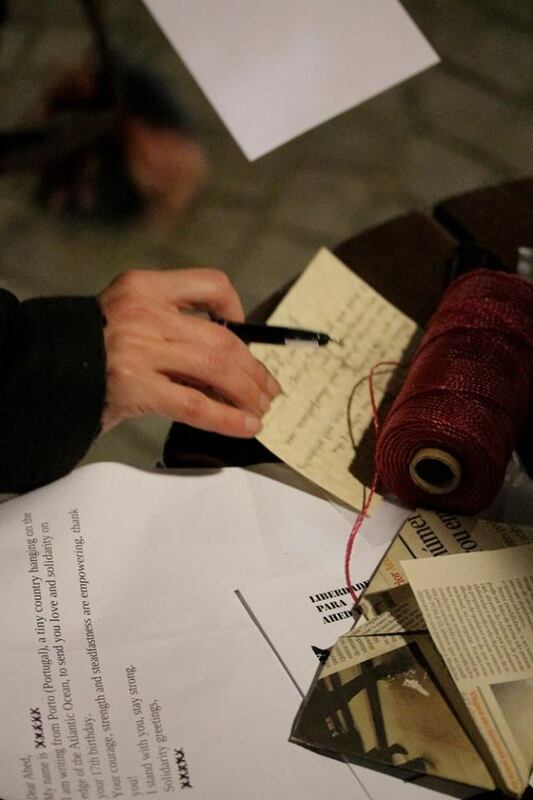 In the mid-summer weather, they distributed information to shoppers and received widespread interest and support. 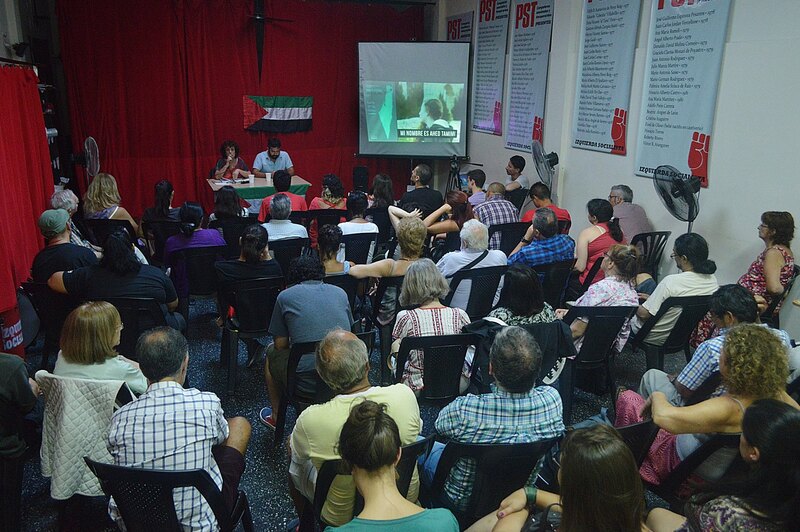 On 27 January, Izquierda Socialista (Socialist Left) held a discussion on Palestine focusing on the case of Ahed Tamimi and the struggle for her freedom. 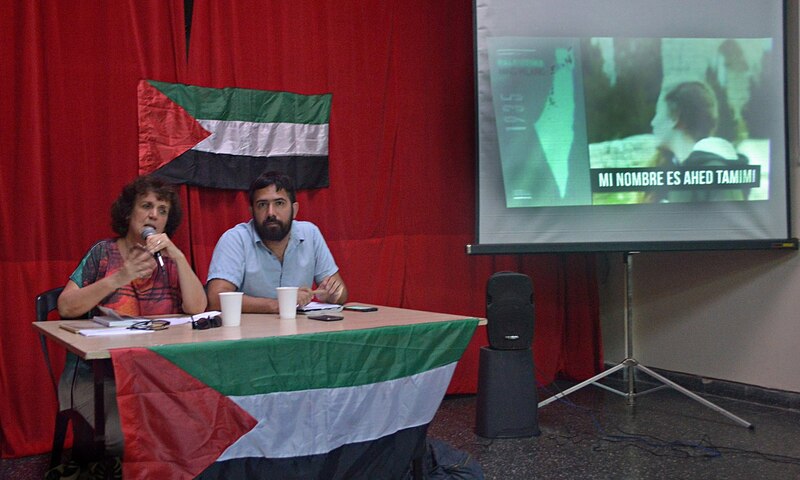 The event included a panel presentation by Laura Marrone, a legislator in the City of Buenos Aires, and Nicolas Nuñez. 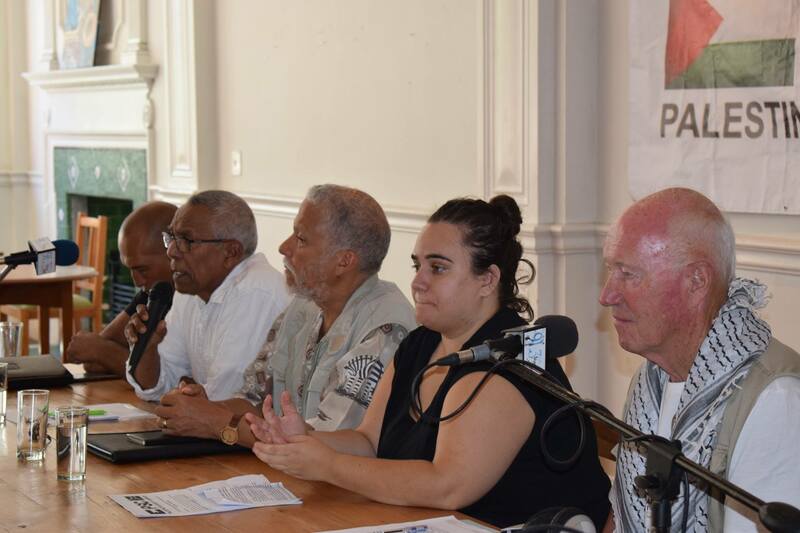 The Revolutionary Communist Group and Fight Racism! Fight Imperialism! 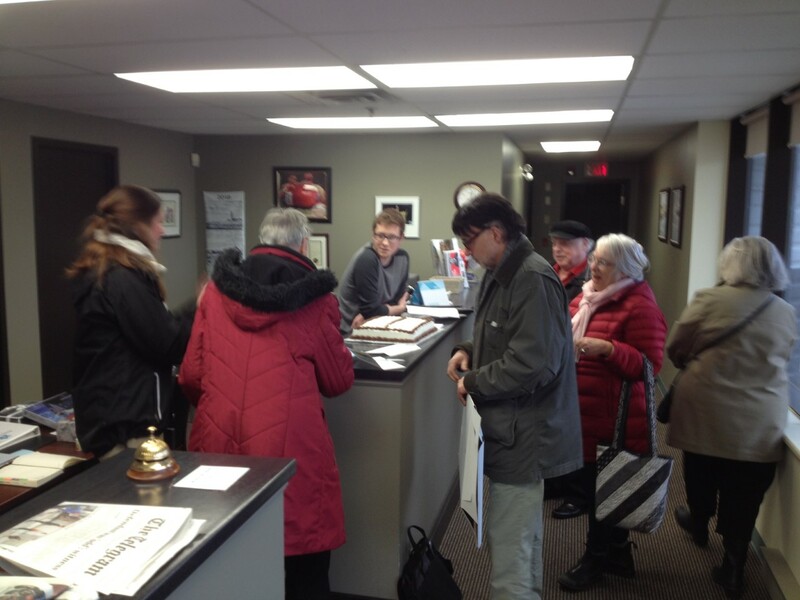 held a tabling event and demonstration in Tyne-on-Newcastle on 28 January. 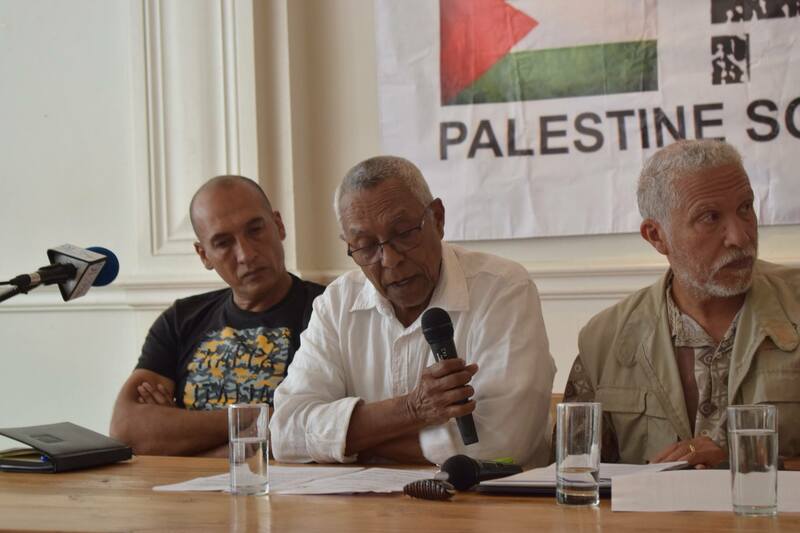 They highlighted the case of Ahed Tamimi and demanded freedom for all Palestinian prisoners as well as demanding that UK banks stop funding and profiting from the Israeli arms industry and occupation. 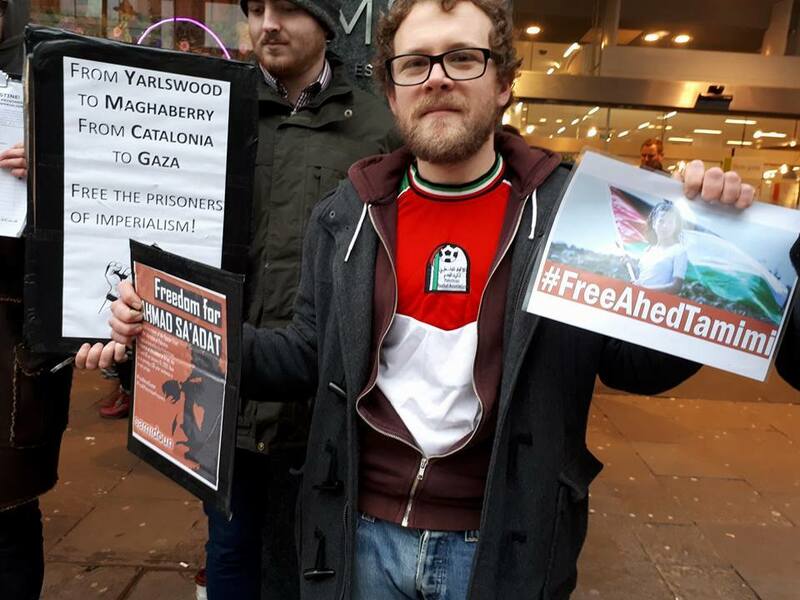 On 28 January, activists working with the CREO cultural association joined with supporters of Amnesty International to organize a tabling day and a photographic action in which people stood with signs urging freedom for Ahed Tamimi and fellow imprisoned Palestinians. 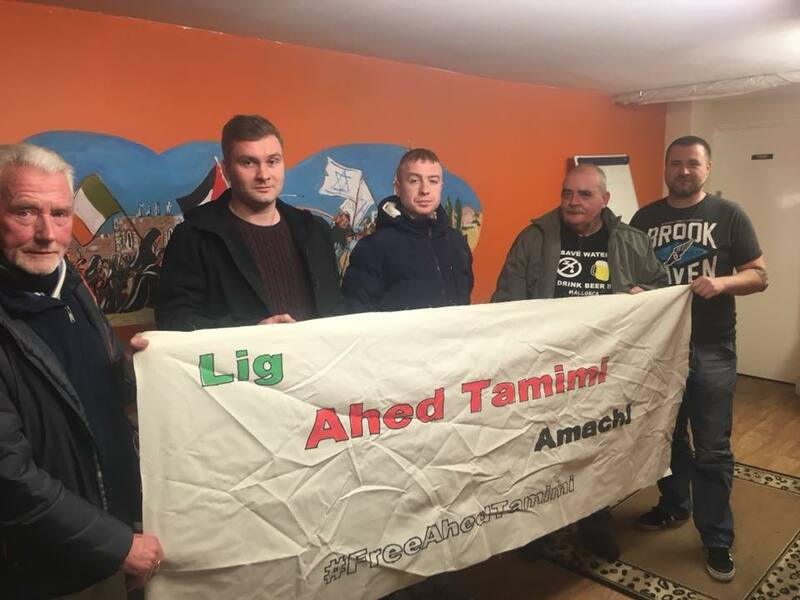 The Iniciatíva za spravodlivý mier na Blízkom východe joined with Amnesty International for an action on the evening of 29 January, in which participants distributed information, signed petitions and held a birthday celebration for Ahed Tamimi. 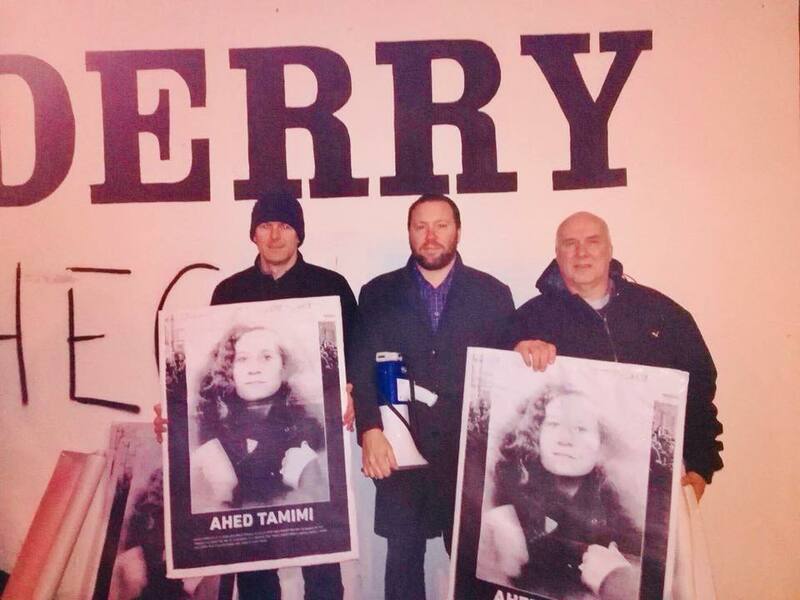 On 30 January, activists with the Ireland Palestine Solidarity Campaign and other organizations came together to demand freedom for Ahed Tamimi. 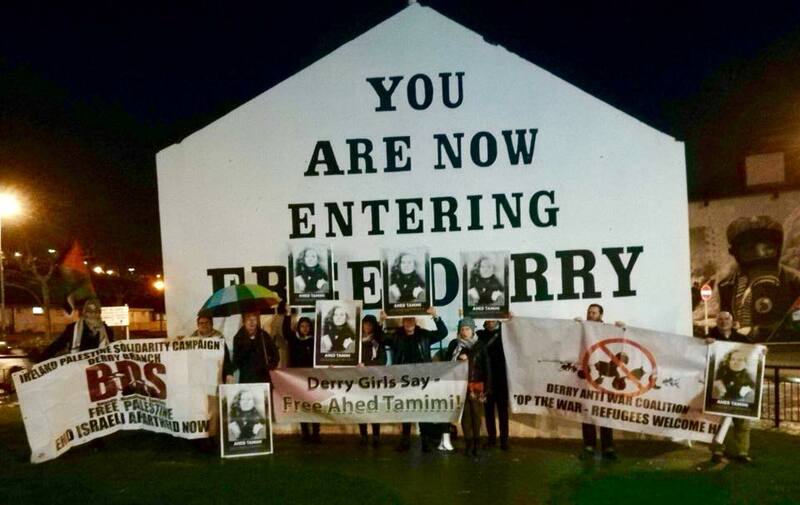 Gathering at the famous Free Derry Corner that continues to represent the Irish anti-colonial struggle, participants carried signs and banners calling for freedom for Ahed and her fellow Palestinian prisoners in Israeli jails. 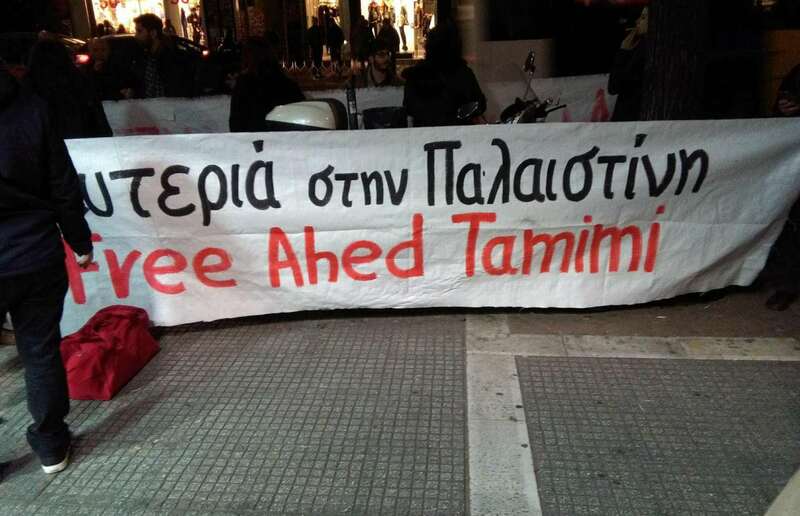 The international days of action for freedom for Ahed Tamimi and all Palestinian prisoners coincided with the visit of Israeli president Reuven Rivlin to Greece, meeting with strong protests in both Athens and Thessaloniki. 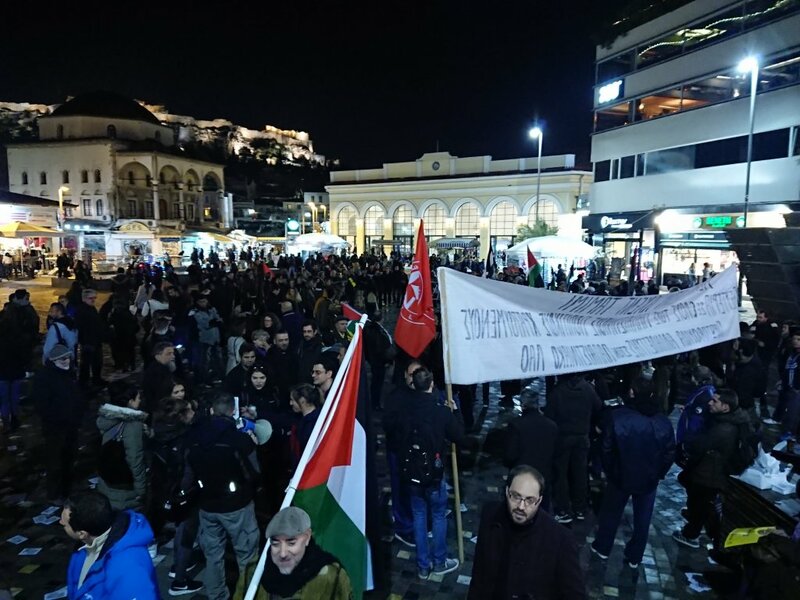 In Athens, the Solidarity Initiative for Palestine – including the Ghassan Kanafani Front and a number of other organizations – organized a mass protest in Monastiraki Square on 30 January for freedom for Palestinian prisoners and the Palestinian people. 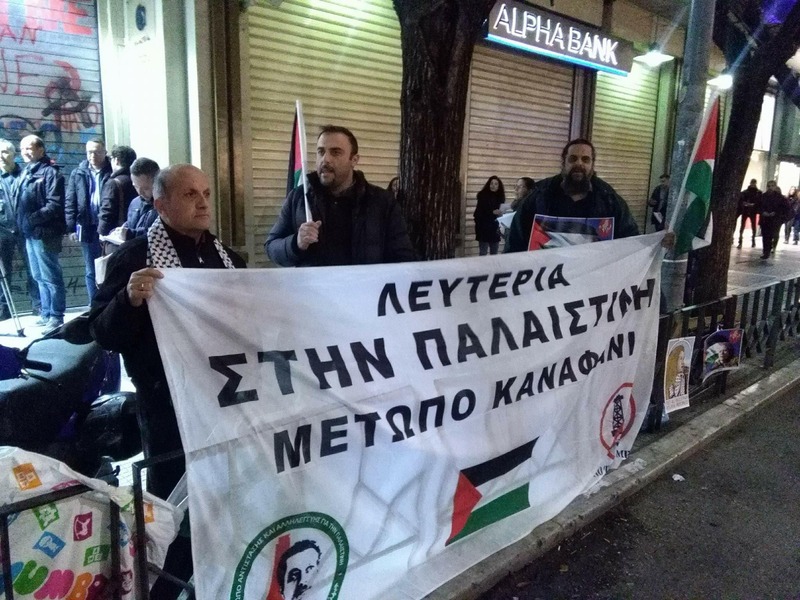 Simultaneous with the Athens protest, the Ghassan Kanafani Front, the Friends of Palestine Association and other Thessaloniki groups organized a demonstration outside the U.S. Consulate to demand freedom for Ahed Tamimi and all Palestinian prisoners as well as to denounce ongoing U.S. crimes against Palestine and the position of the Greek SYRIZA-ANEL government. 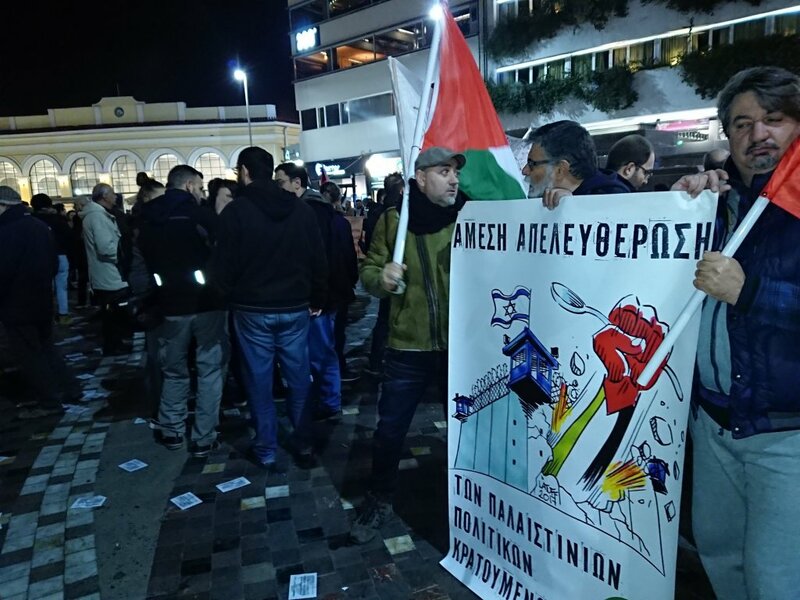 The protest also came in rejection of the visit of Reuven Rivlin to Greece. Organizers with Coup Pour Coup 31, the anti-imperialist collective that is also affiliated with the Samidoun Network, distributed literature and information about Palestinian political prisoners and the Palestinian struggle for liberation on 30 January, marking 16 years of imprisonment of Ahmad Sa’adat, the General Secretary of the Popular Front for the Liberation of Palestine, and the 17th birrthday of Ahed Tamimi. 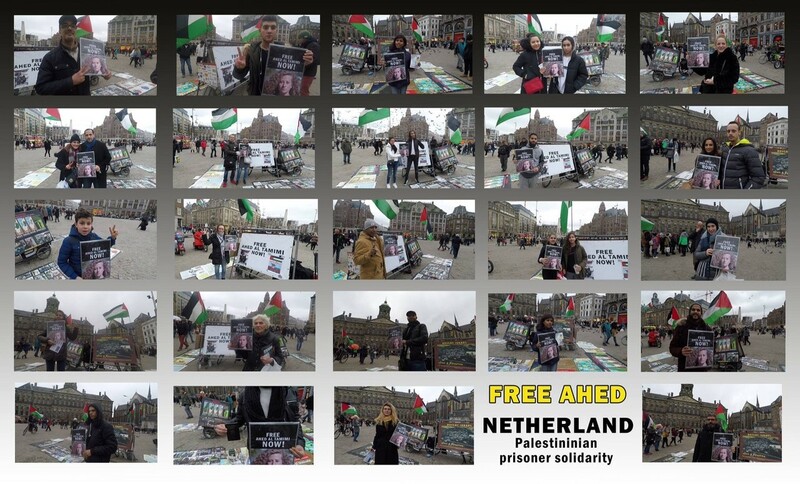 As part of ongoing actions at Dam Square in the center of Amsterdam, organizers have compiled a series of collages and photos of Amsterdam residents and visitors expressing their solidarity and support for Ahed Tamimi. 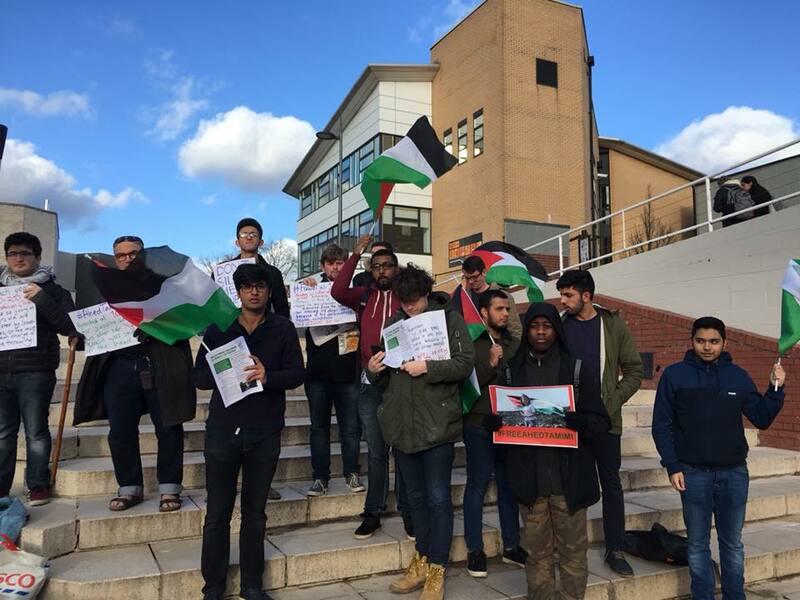 The photos were gathered as part of continuing protests for Boycott, Divestment and Sanctions (BDS) against Israel and support for the Palestinian people. 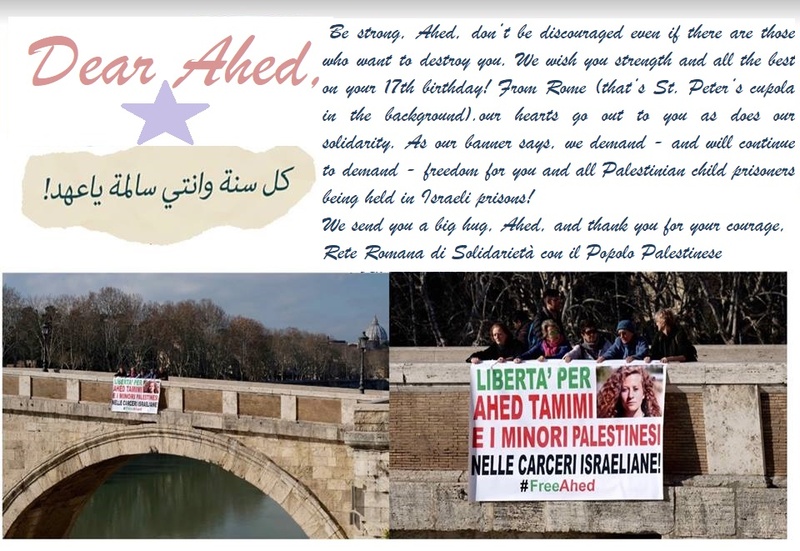 On 30 January, activists from various groups and associations forming part of the “Rome Network of Solidarity with the Palestinian People” did a flash mob/”banner drop” action on Rome’s historic Ponte Sisto bridge, and circulated an electronic greeting card in support of Ahed and fellow imprisoned Palestinians. 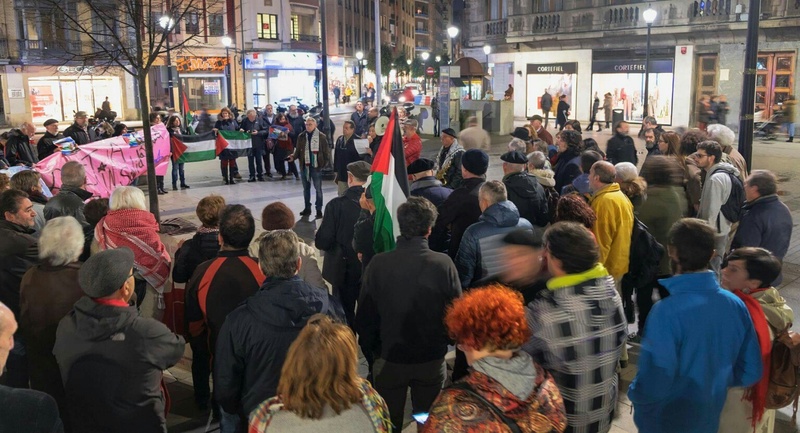 Organizations in Gijón organized a demonstration as part of the international day of action to free Ahed Tamimi on 30 January, gathering in the city’s center to demand freedom for Ahed and all Palestinian prisoners in Israeii jails. 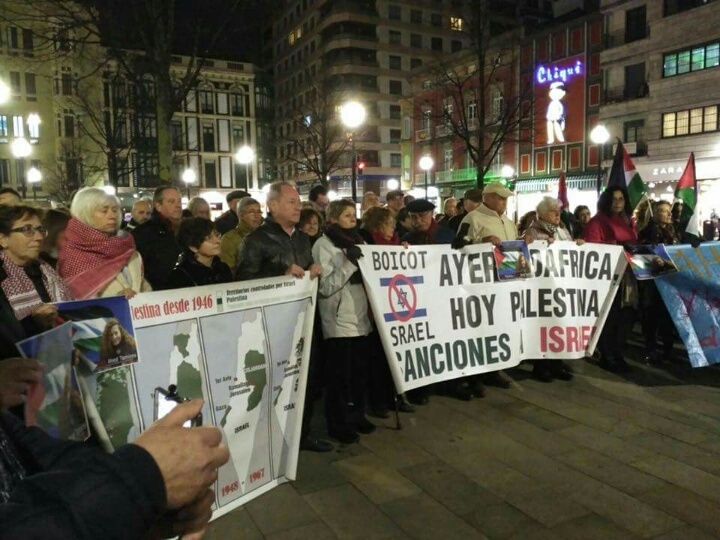 Activists with BDS Pais Valencia organized an action on 30 January in Valencia, Spain in support of Ahed Tamimi and all palestinian political prisoners. 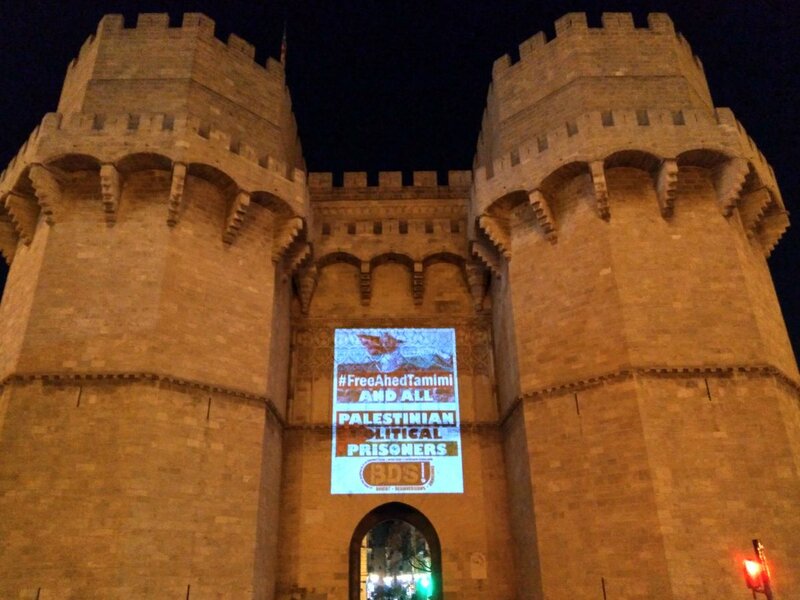 They projected images of Ahed and demands for the freedom of Palestinian prisoners on iconic landmarks, including Serranos Gate/Towers, the main monument of València City, former prison. 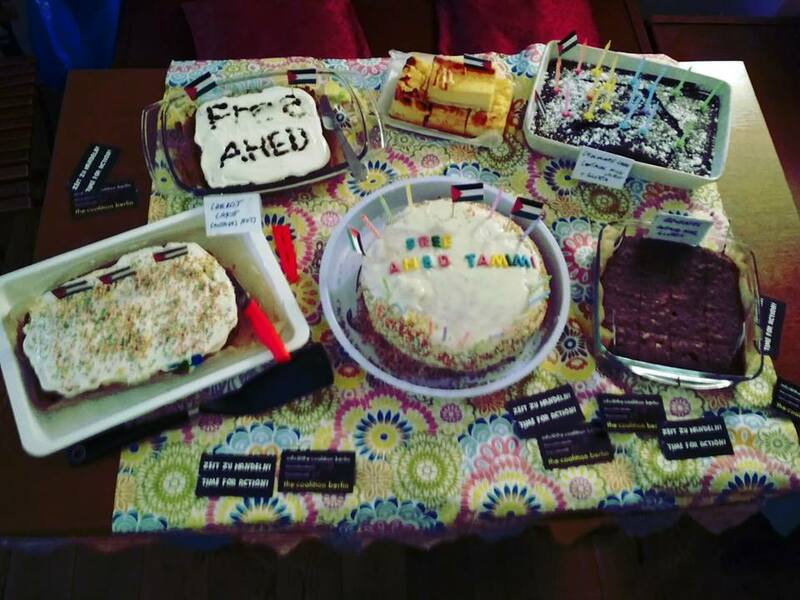 The Coalition Berlin organized a birthday celebration for Ahed Tamimi in a local cafe, with cakes, music and discussion to support Ahed and her fellow Palestinian political prisoners. 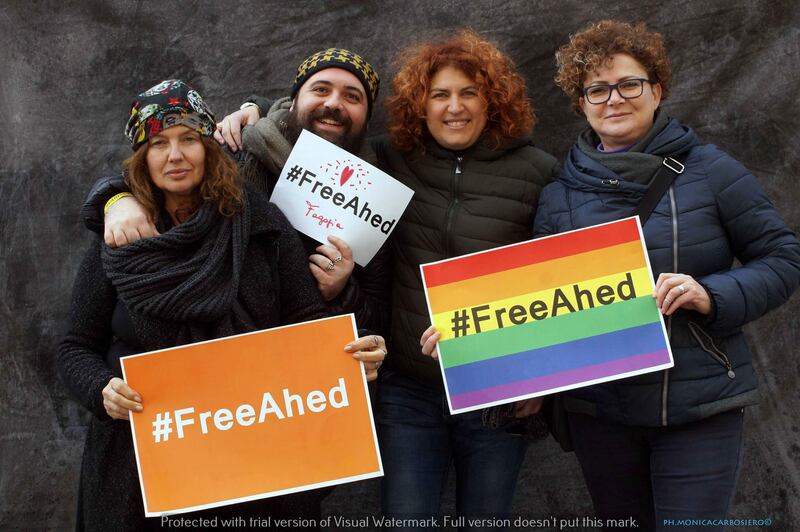 The evening event followed a series of protests and actions in Berlin in support of Ahed, including a strong contingent at the Women’s March on 21 January. 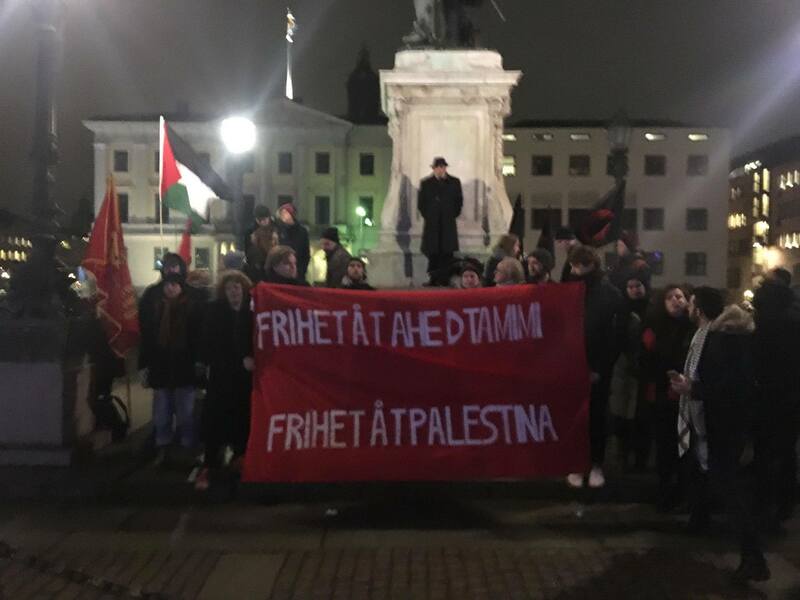 Activists in Gothenburg organizing as Frihet åt Ahed Tamimi Göteborg demonstrated on 30 January at Gustav-Adolfs-Torg in the center of the city to highlight Ahed’s case and demand freedom for Palestinian prisoners. 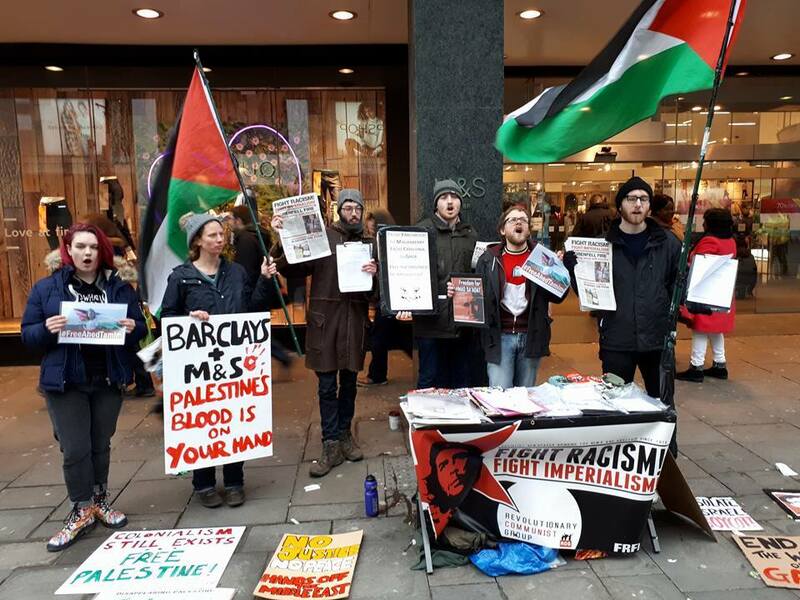 The demonstration was joined by several youth organizations and included speeches demanding an end to ongoing European military and security trade and cooperation with the Israeli state as well as emphasizing the importance of building the BDS movement. 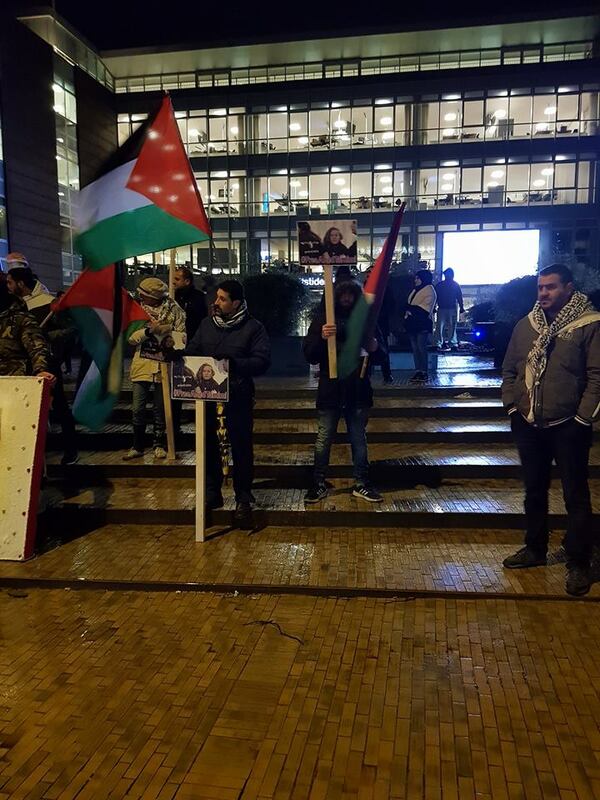 The University of Exeter Friends of Palestine Society organized a solidarity evening for Ahed on 30 January, congratulating her on her birthday and calling for action for her freedom. 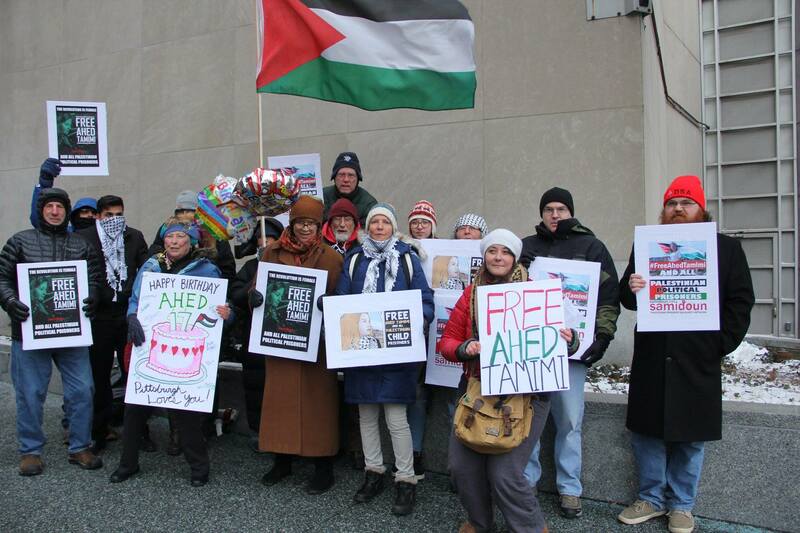 Toronto activists gathered outside the offices of Canadian Foreign Minister Chrystia Freeland on 30 January to call for Canada to take action to free Ahed Tamimi and Palestinian child prisoners. 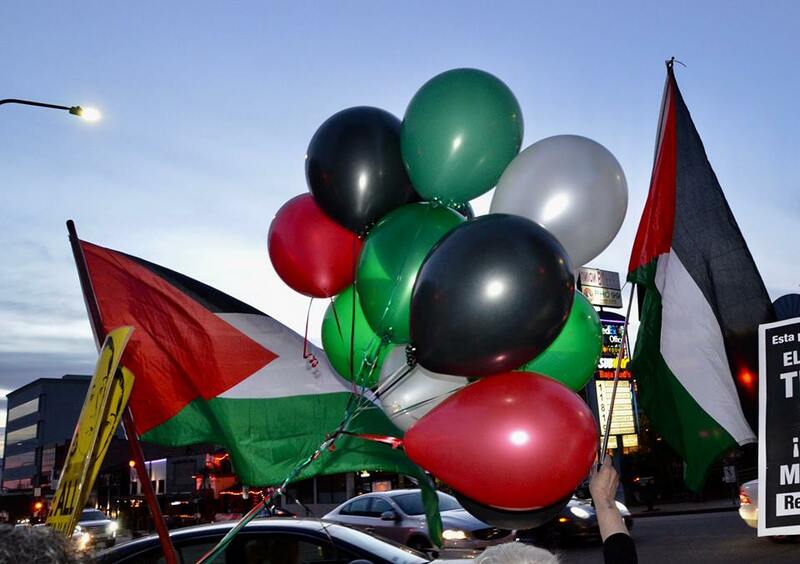 The activists, organized by United for Palestine – Toronto/GTA presented balloons, a birthday cake for Ahed and greetings for the children of Palestine to Minister Freeland’s office to call for a real change in Canadian foreign policy on Palestine. 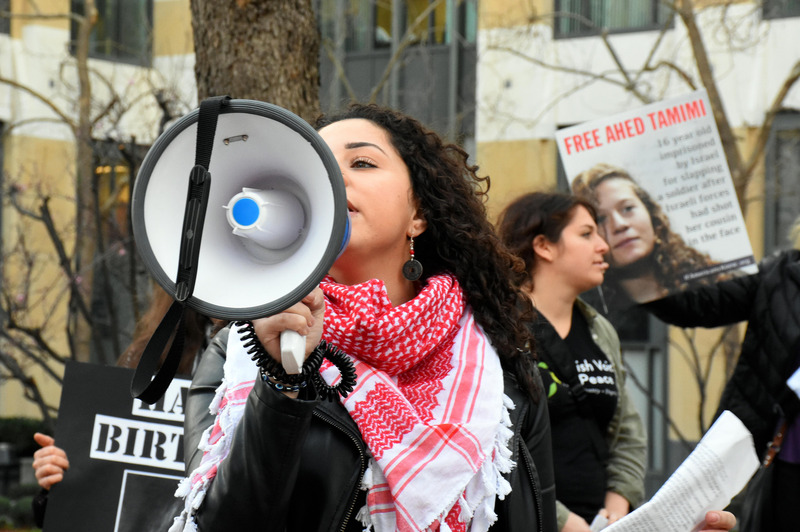 The action also came in support of the No Way To Treat a Child Canada campaign and was followed by a second birthday action for Ahed at Ryerson University. 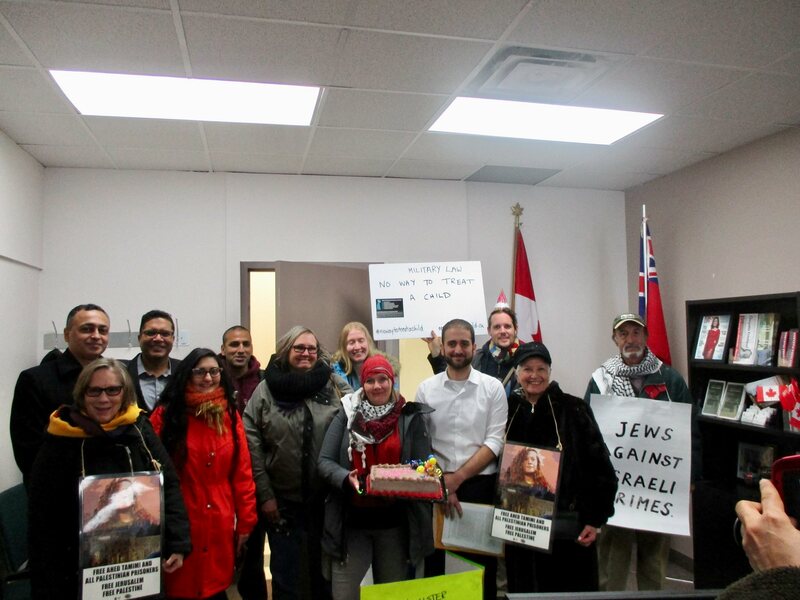 The St. John’s Group for Human Rights in Palestine gathered at the office of Seamus O’Regan, the federal Minister of Veterans Affairs, to share a card, a birthday cake and information about imprisoned Palestinian teen Ahed Tamimi with the staff of the office. 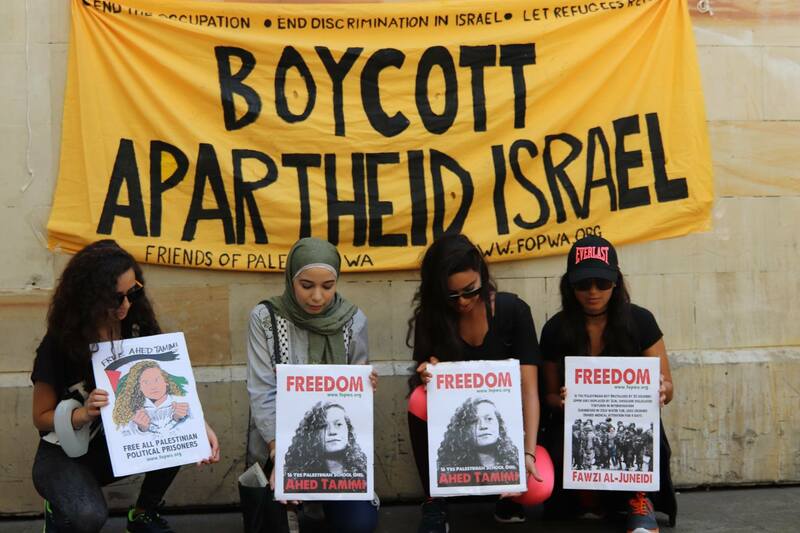 They called for Canada to take diplomatic action to free Ahed and other imprisoned Palestinian children. 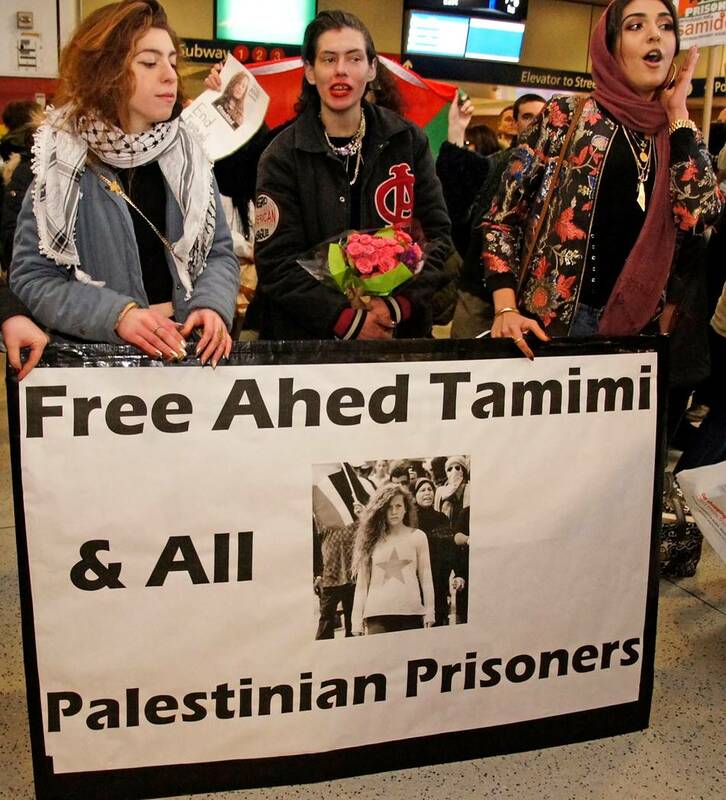 Hundreds of participants from over 40 organizations gathered in New York’s busy transit and commuter hub, Penn Station, on 30 January, for a spirited, strong protest to free Ahed Tamimi and all Palestinian prisoners. 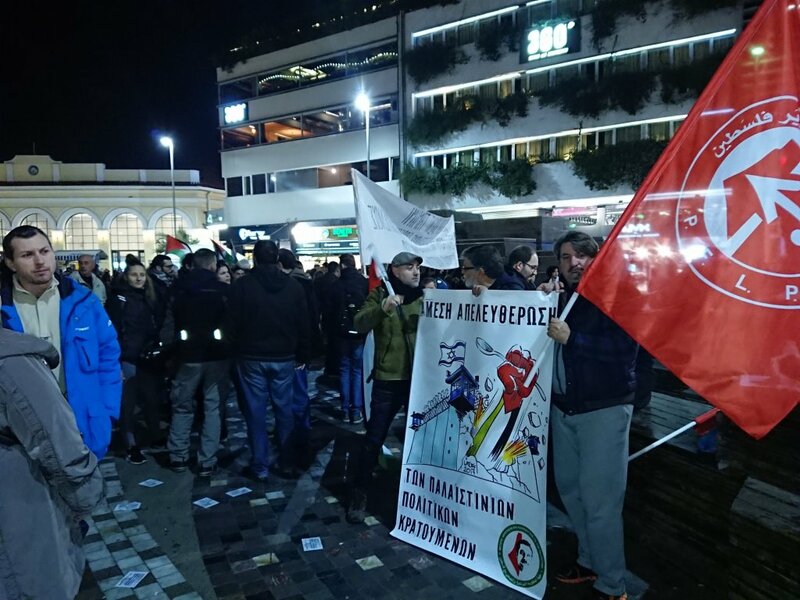 The action saw broad participation from a wide array of social justice organizations and is the latest large action in the city inspired by Ahed’s case. 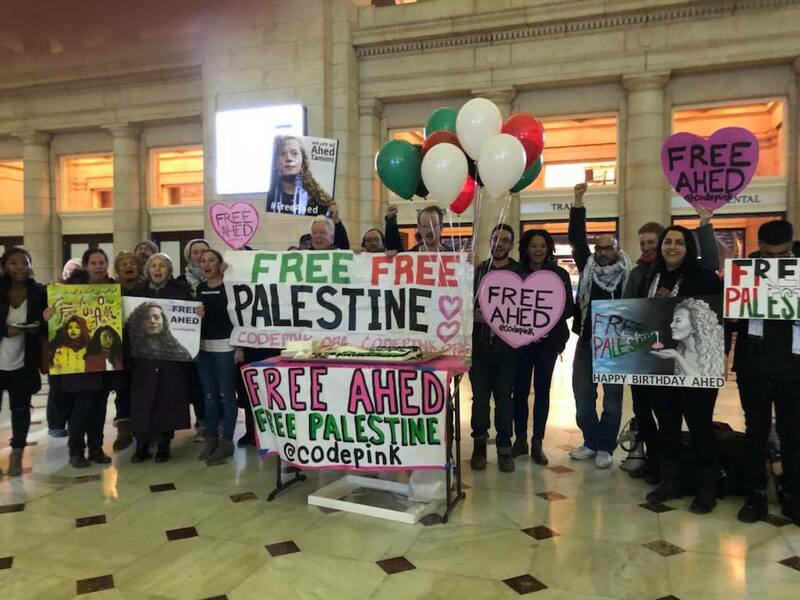 Transit hubs also were a site for action for Ahed in Washington, DC on 30 January as participants gathered in Union Station to celebrate Ahed’s birthday in an action organized by CODEPINK. 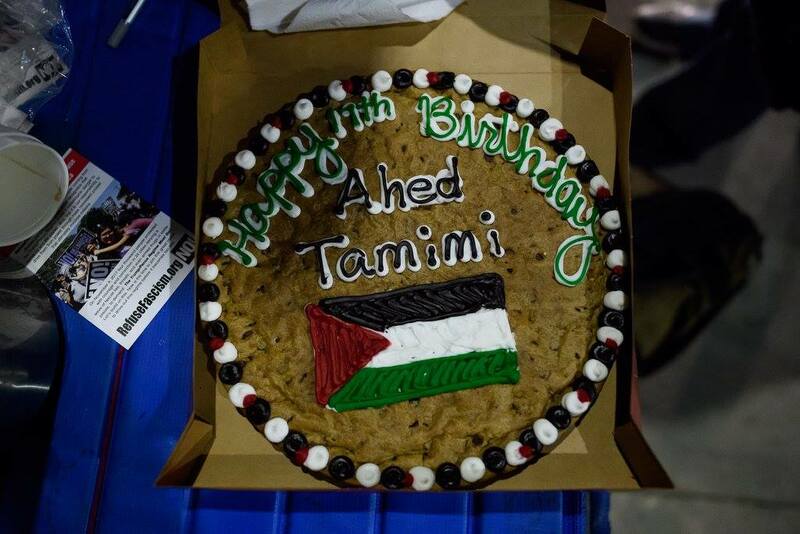 Participants protested and distributed information as well as singing “Happy Birthday” and distributing a Palestine-themed cake to salute Ahed’s birthday. 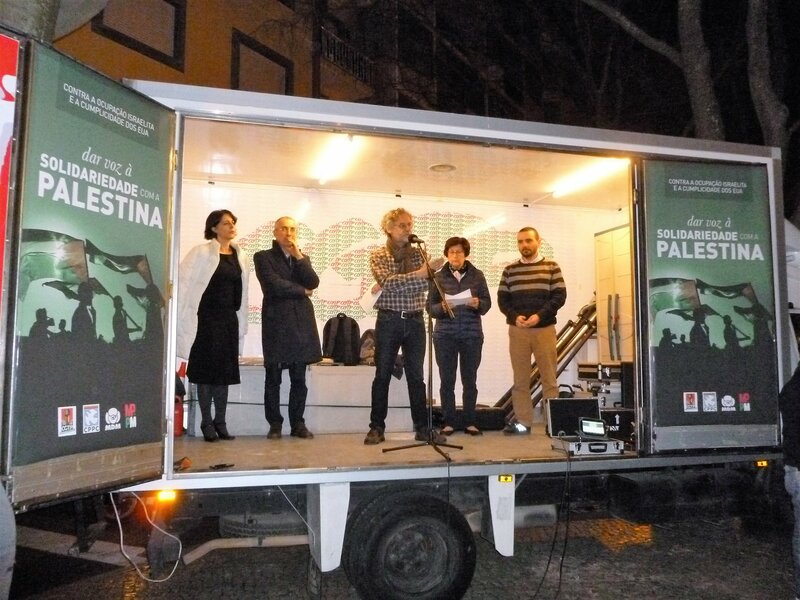 Jewish Voice for Peace was joined by an array of social justice groups in the city for a protest and birthday gathering on 30 January outside the Israeli Consulate in Atanta. 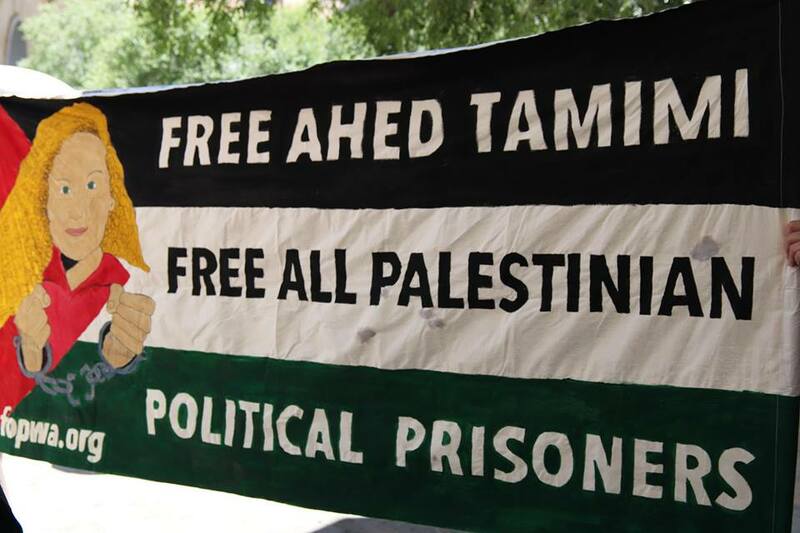 Participants called for the immediate release of Ahed and all Palestinian prisoners. 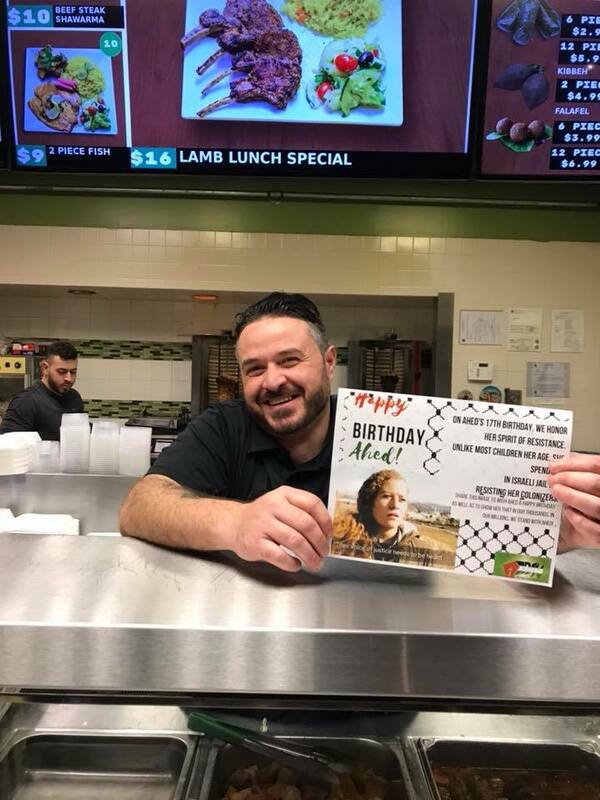 The Dallas Palestine Coalition gathered at WFAA Studios in Victory Park on 30 January to distribute information and celebrate Ahed’s birthday. 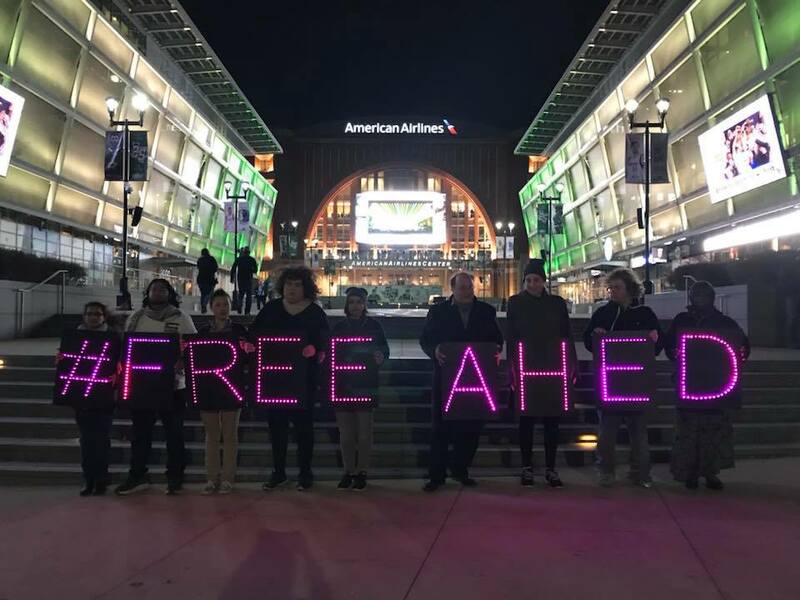 Participants held up lighted signs reading “Free Ahed” as they gathered in front of the iconic local landmark. 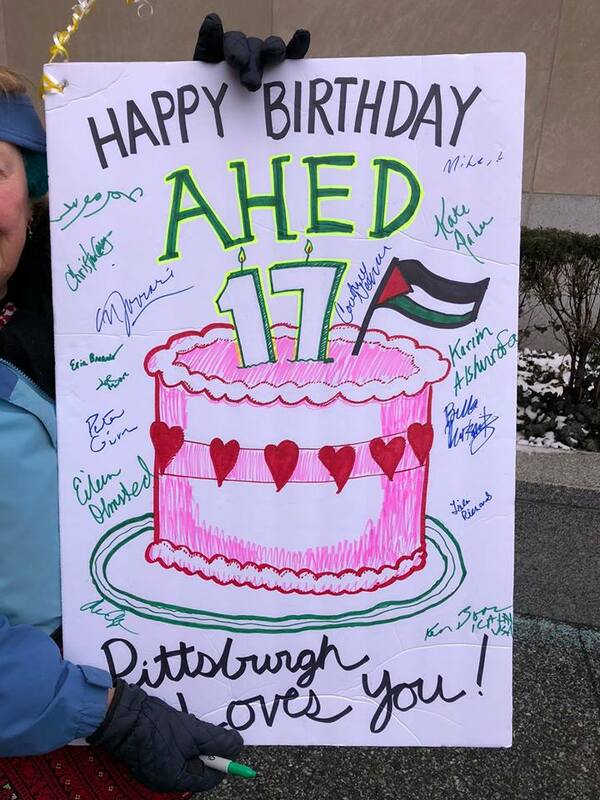 Activists with the Pittsburgh Palestine Solidarity Committee and their supporters braved an 8-degree (Fahrenheit) wind chill to take to the streets on 30 January to free Ahed. 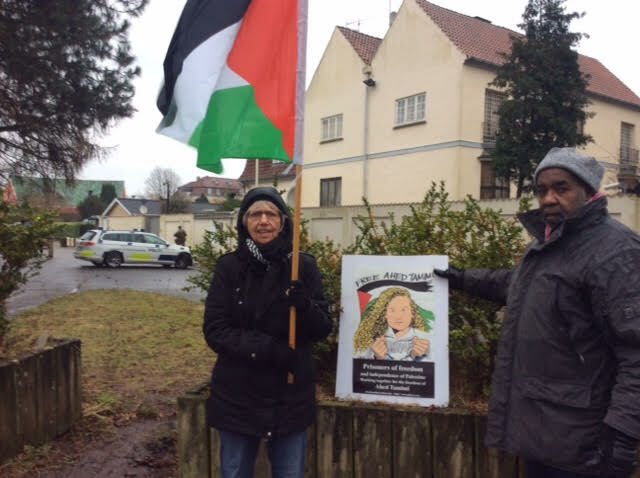 They distributed information and displayed signs and materials highlighting Ahed’s case and that of fellow Palestinian children. 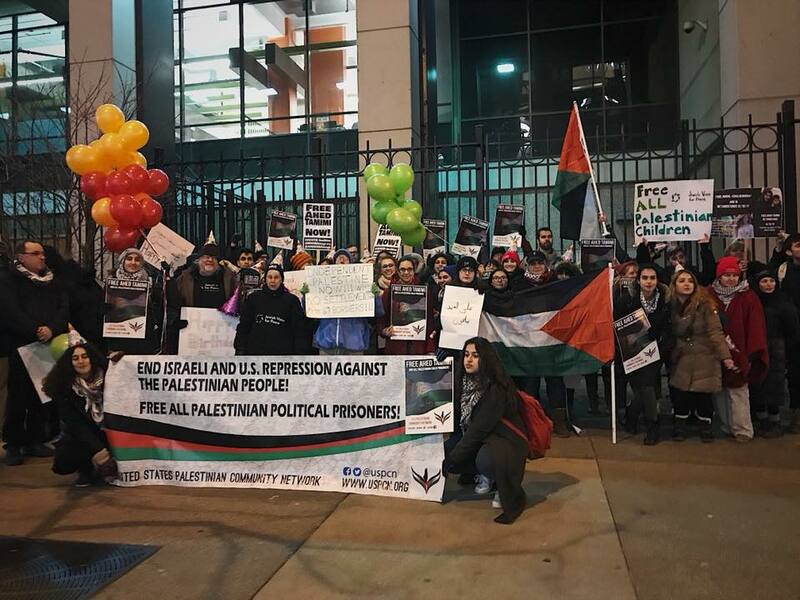 On 30 January, over 20 diverse human rights and women’s organizations rallied outside the Israeli Consulate in Los Angeles to demand the release of Ahed Tamimi. 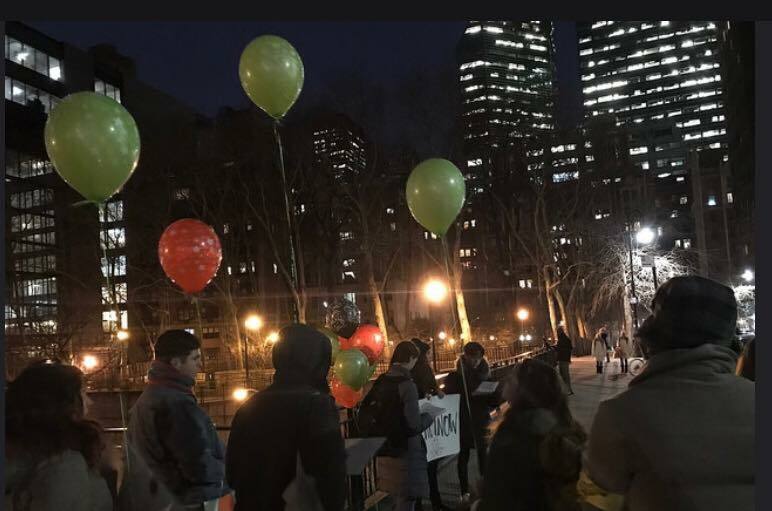 The LA4Palestine Coalition‘s action included colorful balloons in red, black, green and white and a giant birthday card for Ahed, as she turned 17 in Israeli prison. 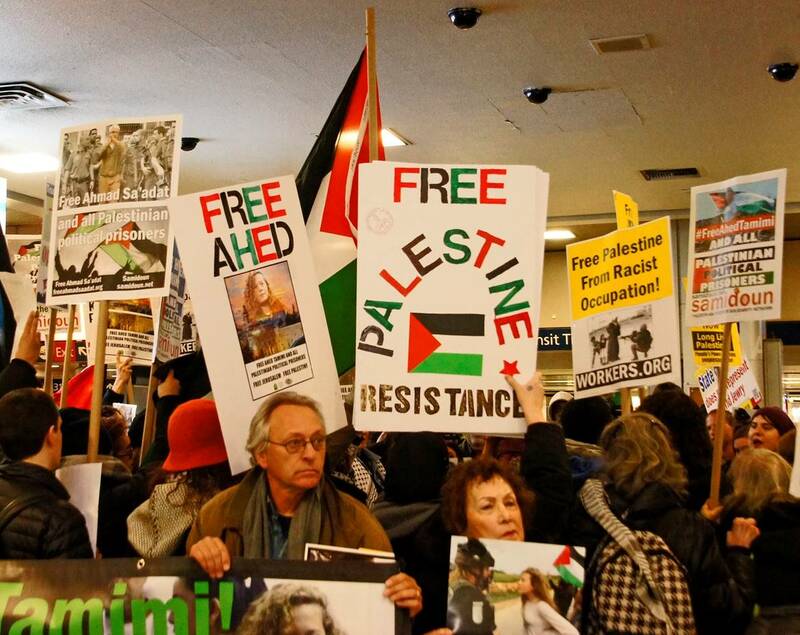 The protest followed earlier strong LA actions for Ahed’s release as well as a powerful intervention in challenging Zionism at the Women’s March. 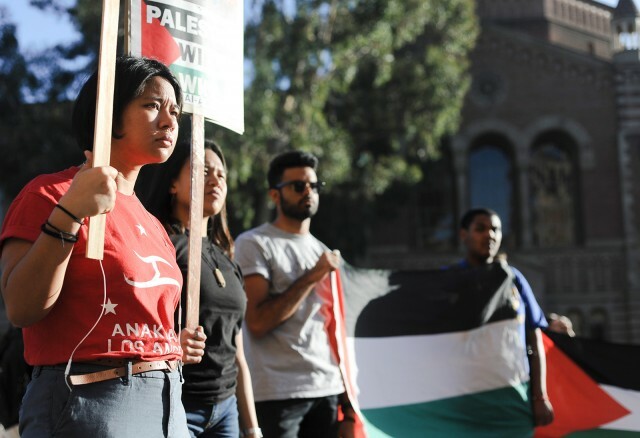 Meanwhile, on 31 January, dozens of UCLA students also gathered outside Royce Hall at the University for a protest and birthday event to demand Ahed’s freedom and that of fellow Palestinian child prisoners. 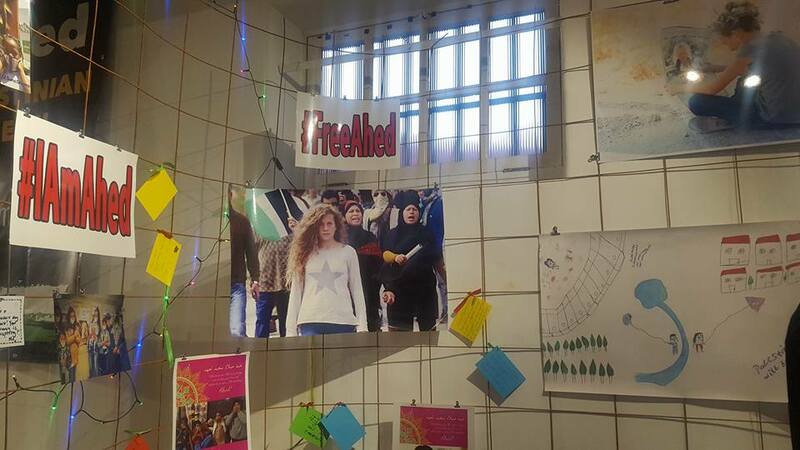 On 31 January, a coalition of groups, including the art organization 2 Suns Shamsaan launched an exhibition of art and photography for Ahed Tamimi at the site of the former Women’s Jail on Constitution Hill in Johannesburg, South Africa. 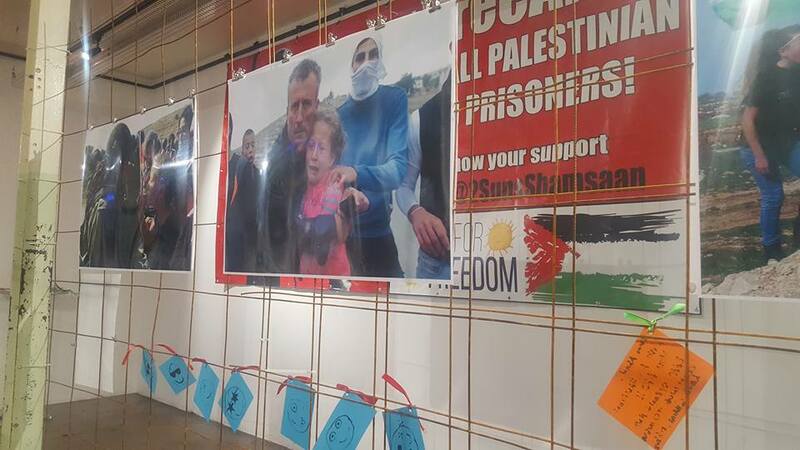 The exhibition will be on display for a month and includes photographs of Ahed and others in Palestine engaged in protests and resistance to occupation. 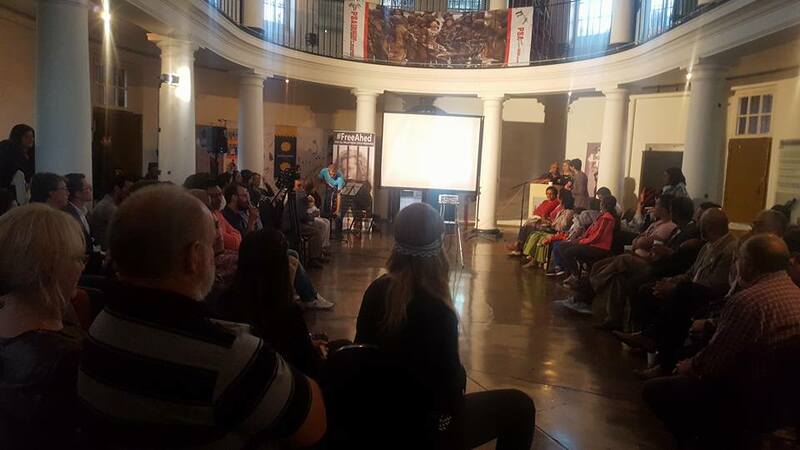 Ahed and her family traveled to South Africa earlier in 2017 for a solidarity visit with multiple public events and presentations. 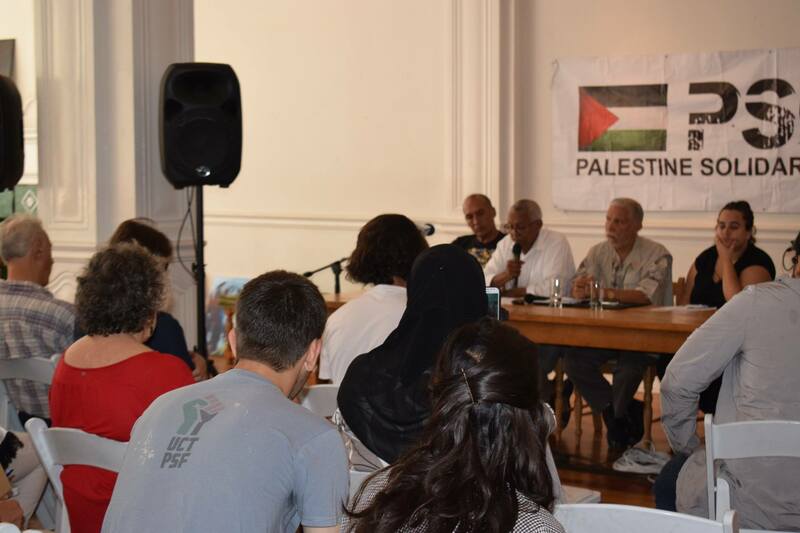 The Palestine Solidarity Campaign organized a press conference and public event on 31 January to salute Ahed on her 17th birthday and highlight the struggle of Palestinian prisoners for freedom, making links between the historic struggle of South Africa’s imprisoned anti-apartheid strugglers and Palestinians such as Ahed who are imprisoned in Israeli jails today. 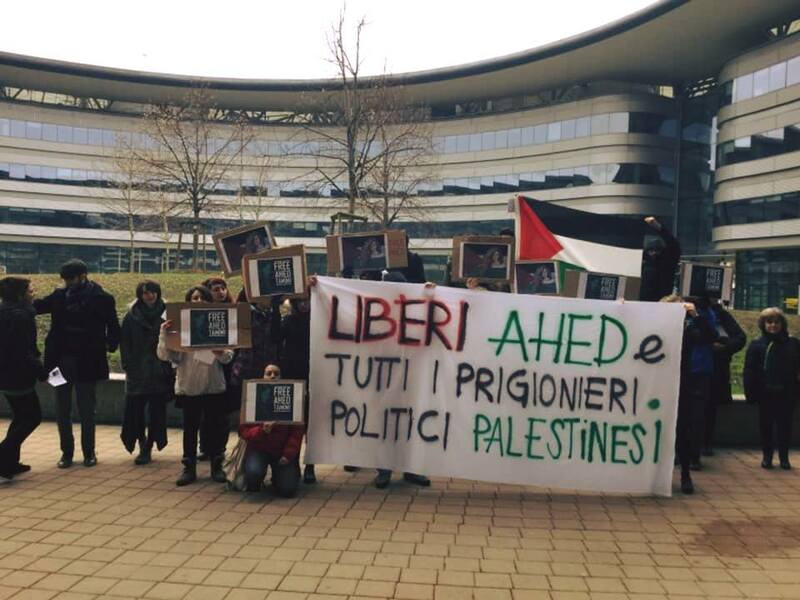 Student activists with Progetto Palestina joined with Amnesty International for a demonstration at the University of Turin. 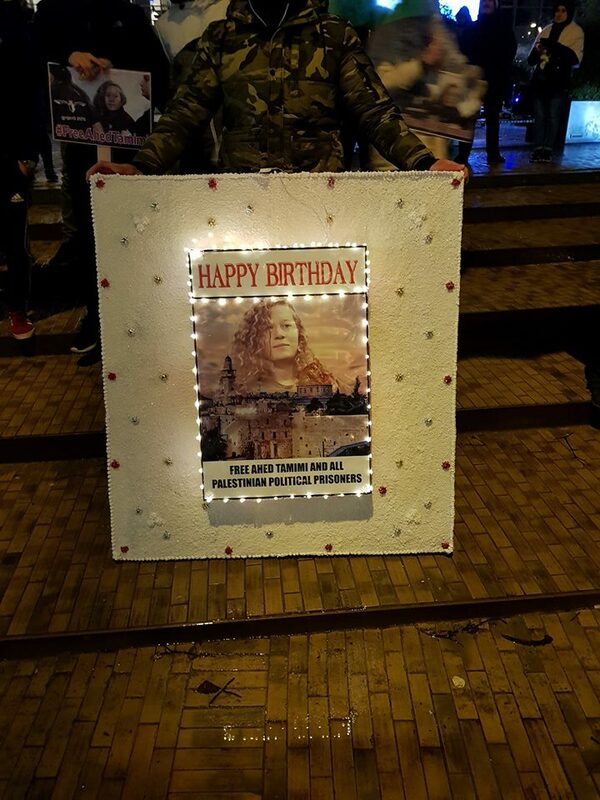 Participants marked Ahed’s birthday on 31 January by distributing information and caling for her freedom from Israeli prisons. 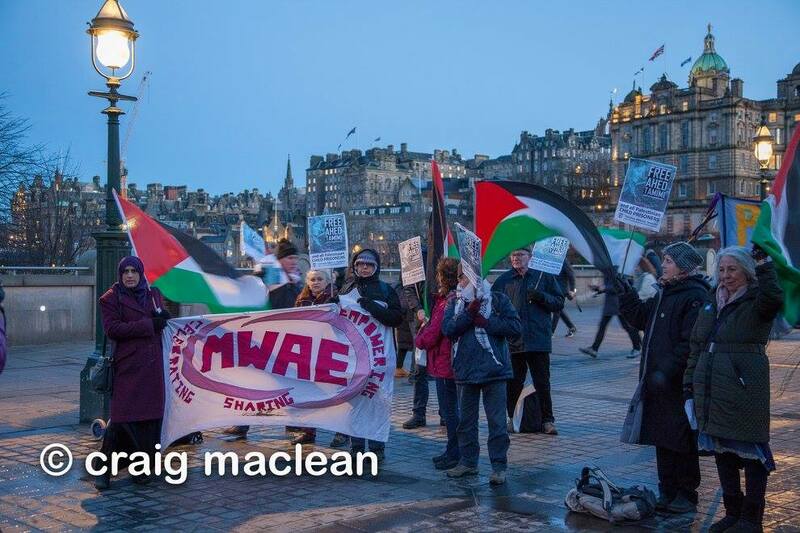 The Scottish Palestine Solidarity Campaign organized outdoor actions and collective photography on the streets of the Scottish capital on 31 January for Ahed Tamimi. 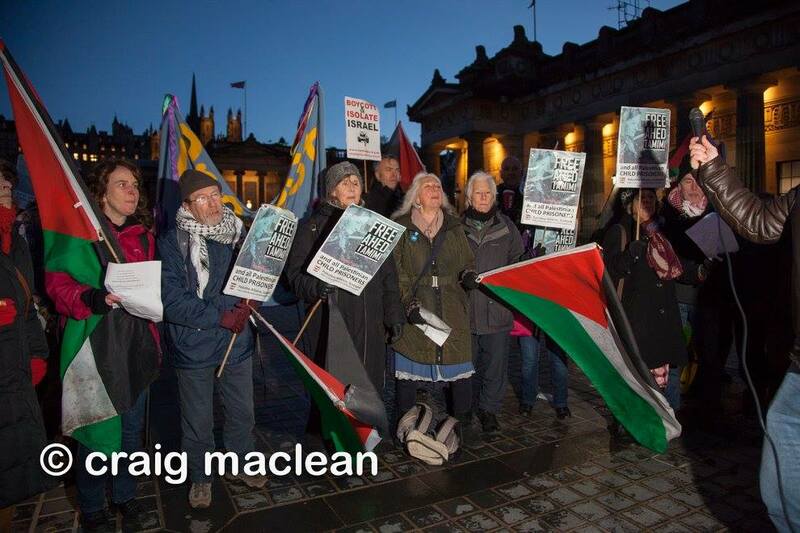 Participants in Edinburgh also sang a collective song celebrating Ahed’s birthday and demanding her freedom. 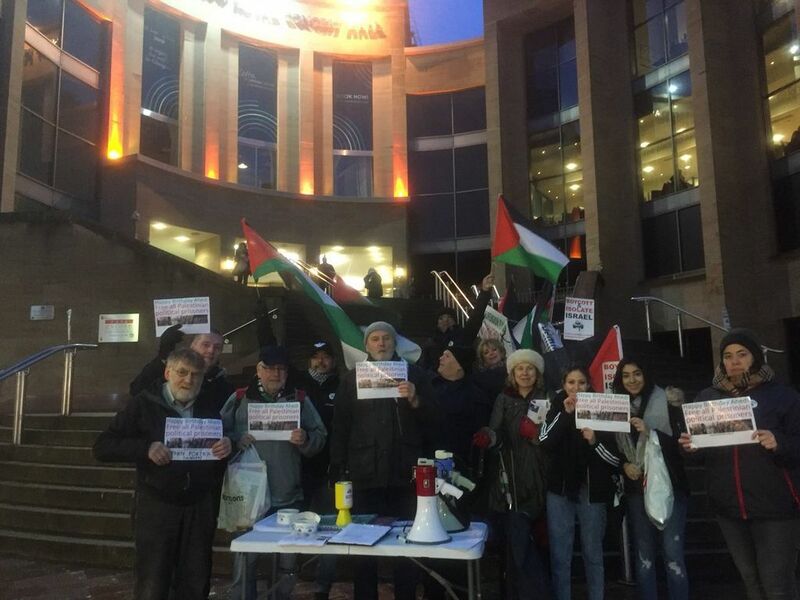 The SPSC photo and solidarity campaign for Ahed’s birthday also continued in Glasgow, where people gathered on 31 January at the Buchanan Steps to stand in solidarity for Ahed’s freedom and express their birthday greetings. 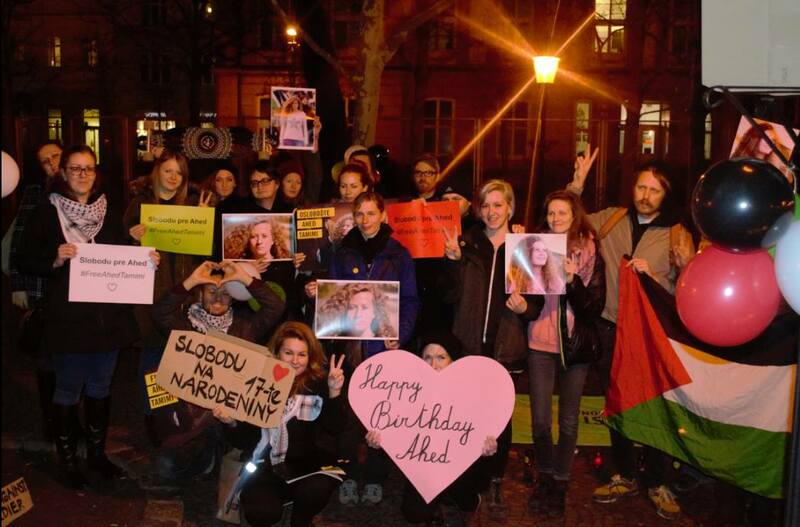 On 31 January, Ahed’s Friends in Denmark made an action for Ahed’s freedom at the Israeli Embassy in Copenhagen and tried to deliver an open protest letter demanding the immediate Freedom of Ahed Tamini and all Palestinian Prisoners in Zionist occupation Prisons – and send warm congratulations to Ahed on her 17th birthday. 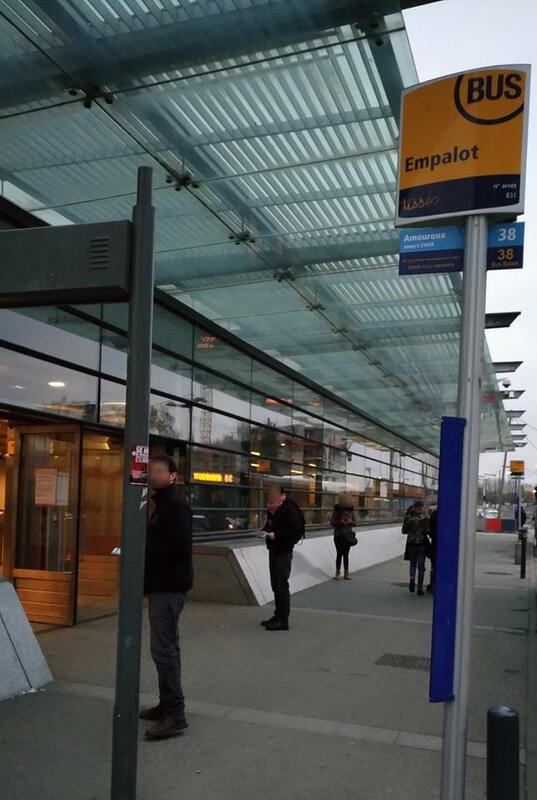 Military and police guards said that the Israeli Embassy refused to receive the letter and had closed its mailbox. 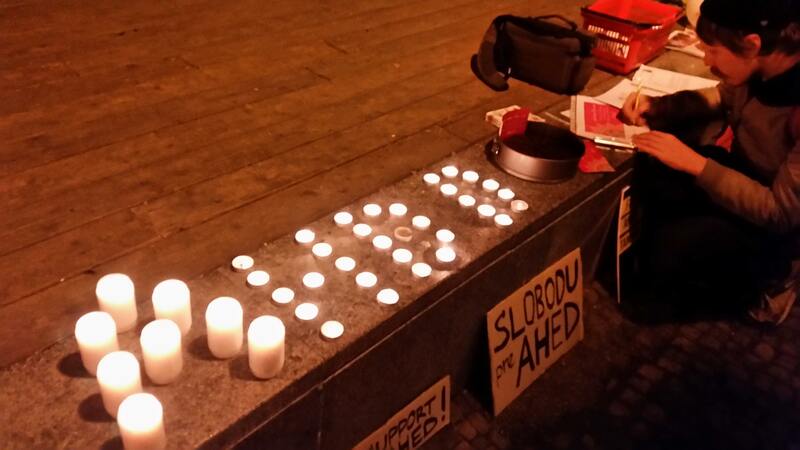 Later on 31 January, demonstrators gathered at Gammeltorv in Copenhagen for a demonstration demanding Ahed’s freedom and marking her birthday. 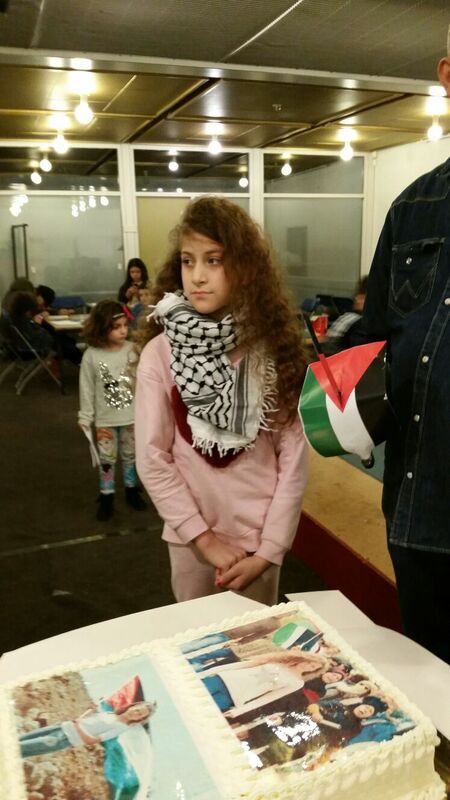 In the town of Brabant in the Aarhus area in Denmark, Palestinian community organizers held an event marking Ahed’s birthday and supporting Palestinian children’s rights on 31 January. 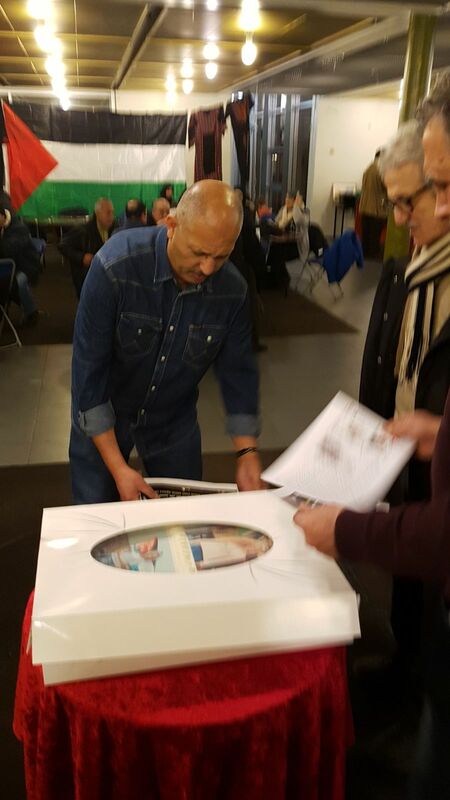 Palestinian children in the community joined in for cake featuring photos of Ahed Tamimi and discussions about the struggle of Palestinian prisoners. 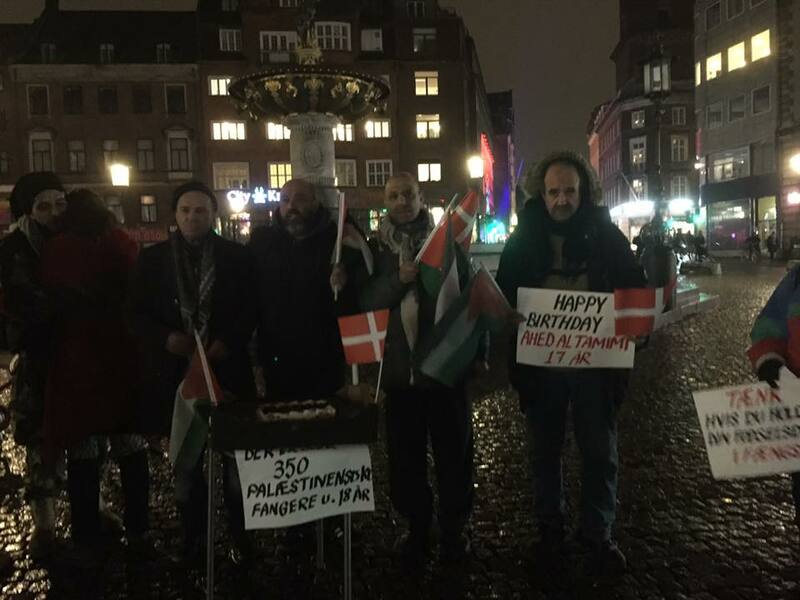 The Palestinian House in Odense organized a protest action and birthday celebration for Ahed Tamimi at Banegardspladsen in Odense. 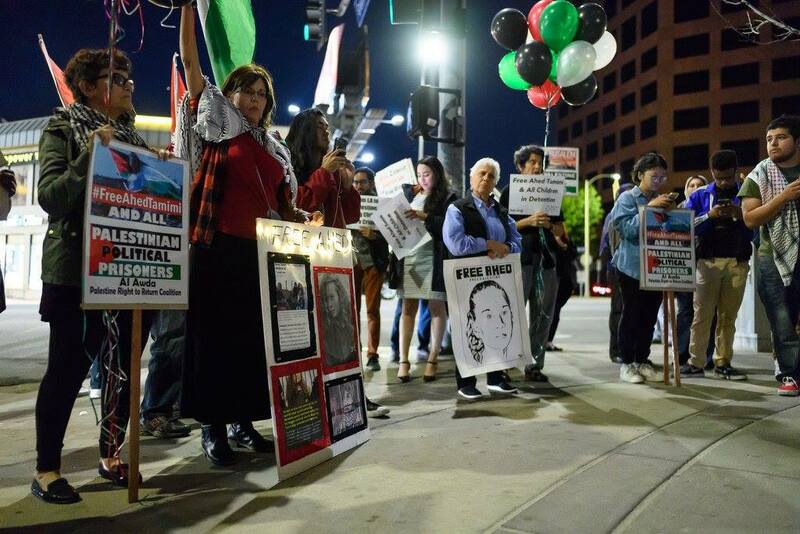 Participants distributed information, held signs and lights to highlight Ahed’s case and that of fellow Palestinian prisoners in Israeli jails. 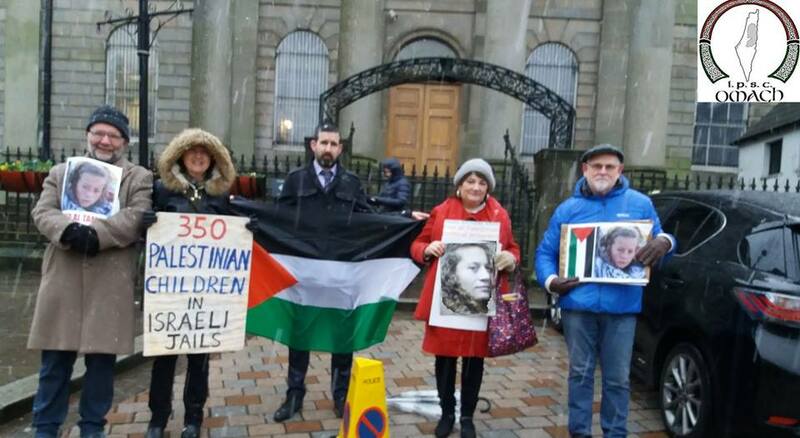 Ireland Palestine Solidarity Campaign activists gathered for a birthday event and protest outside the Omagh Courthouse, demanding freedom for Ahed and highlighting the plight of 350 Palestinian child prisoners. 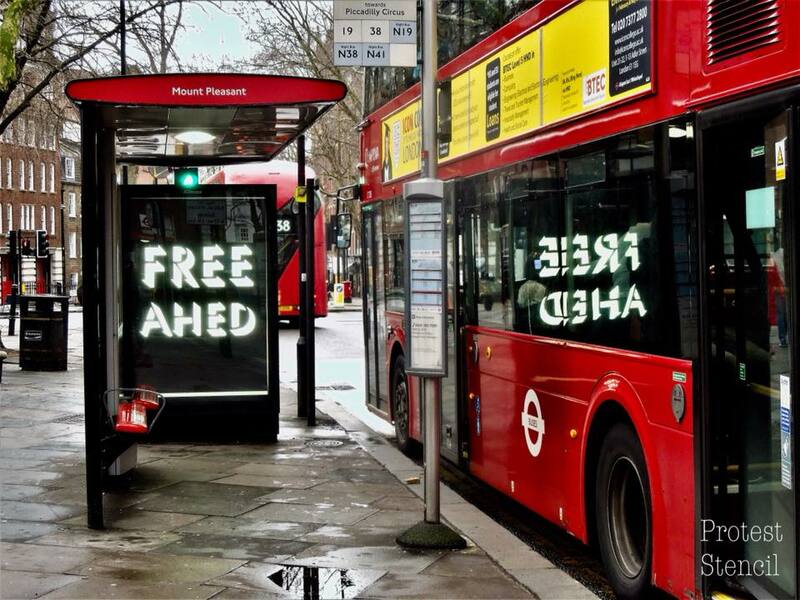 Artist-activists launched another “guerilla advertising” campaign in London transit stations on 31 January, as Protest Stencil posted photos of “Free Ahed” graphics inserted into bus stations and transit ad areas throughout the city. 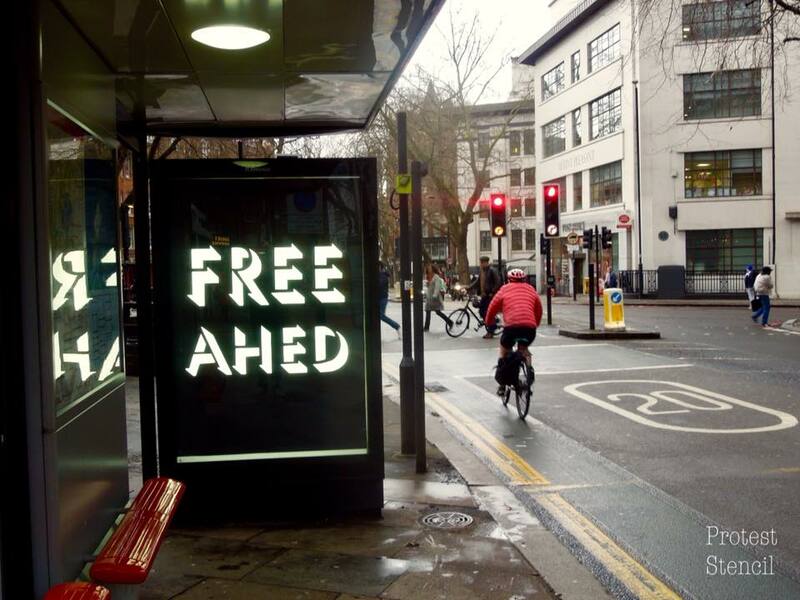 This followed on earlier actions in the city that brought the campaign for Ahed’s freedom to the Tube and bus stations. 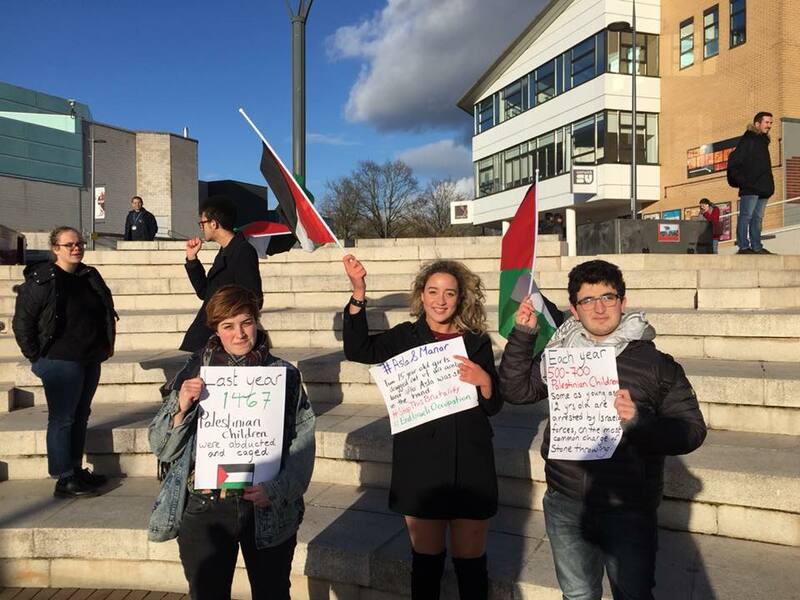 In Warwick, protesters with Warwick: Friends of Palestine Society and Warwick for Justice in Palestine gathered on 31 January at the university’s Piazza to call for Ahed’s freedom and that of all Palestinian prisoners. 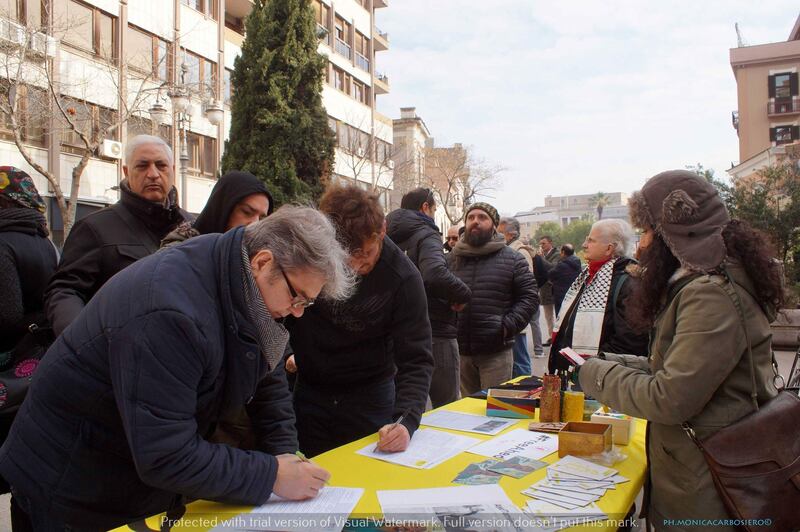 They also organized an open space to gather letters of solidarity to be sent to Ahed in Israeli prison. 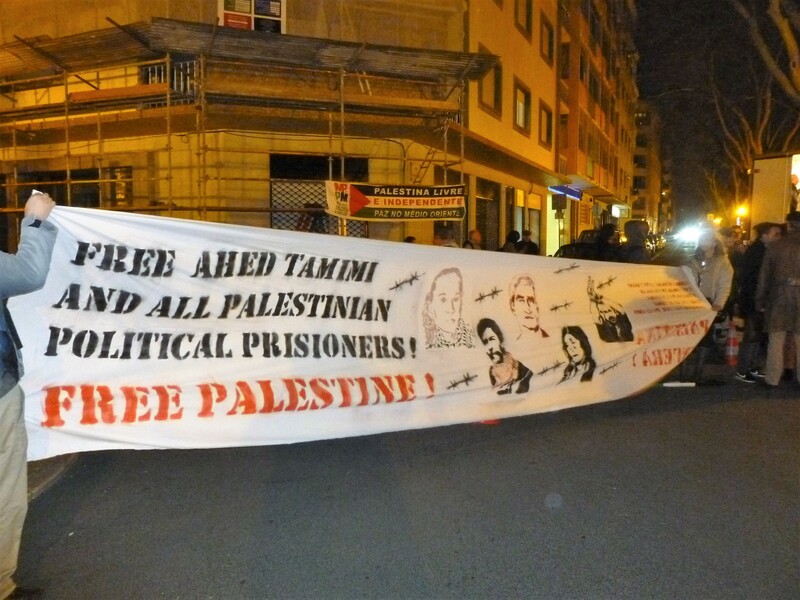 Activists with Grupo Acção Palestina in Porto marked Ahed’s 17th birthday behind bars on 31 January with a large outdoor display of photos, balloons and banners highlighting her case and that of other Palestinian prisoners. 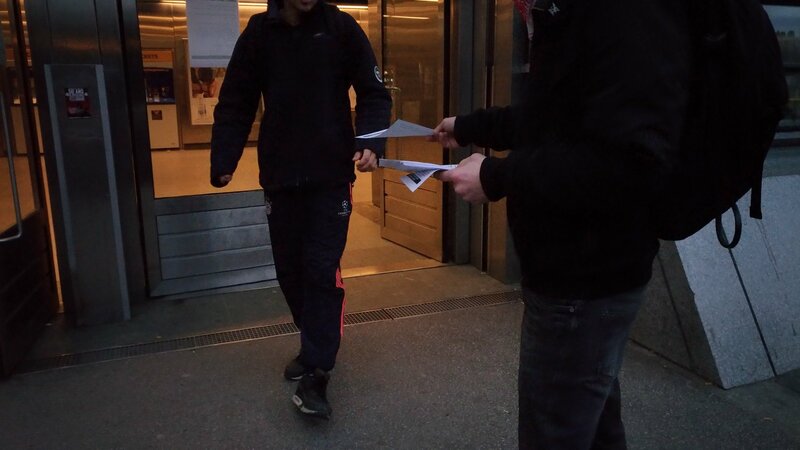 Participants distributed information and collected solidarity letters to be sent to Ahed in Israeli prison. 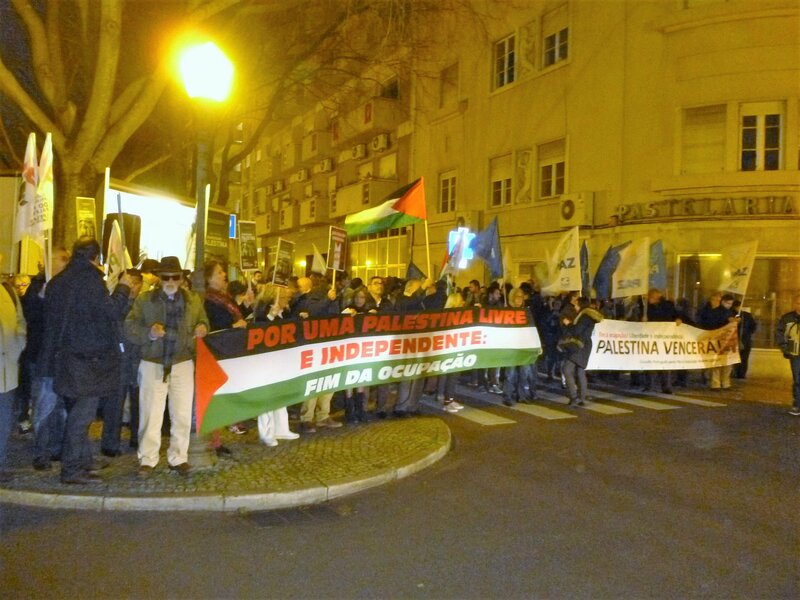 The Movimento pelos Direitos do Povo Palestino e pela Paz no Médio Oriente (MPPM) and multiple other organizations in Portugal organized a large solidarity demonstration on 31 January outside the Israeli embassy in Lisbon. 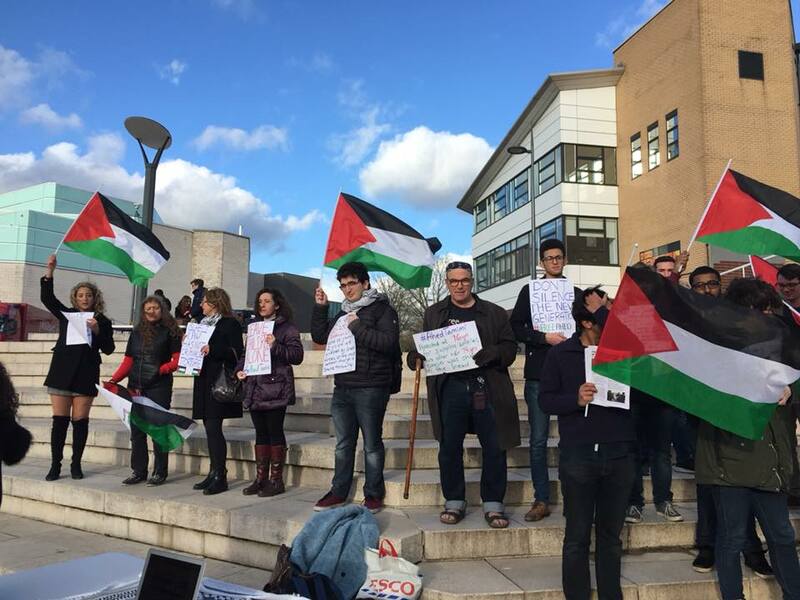 Approximately 200 people joined the demonstration, which demanded freedom for Ahed Tamimi and all Palestinian prisoners, freedom for Palestine and an end to occupation, apartheid and colonization. 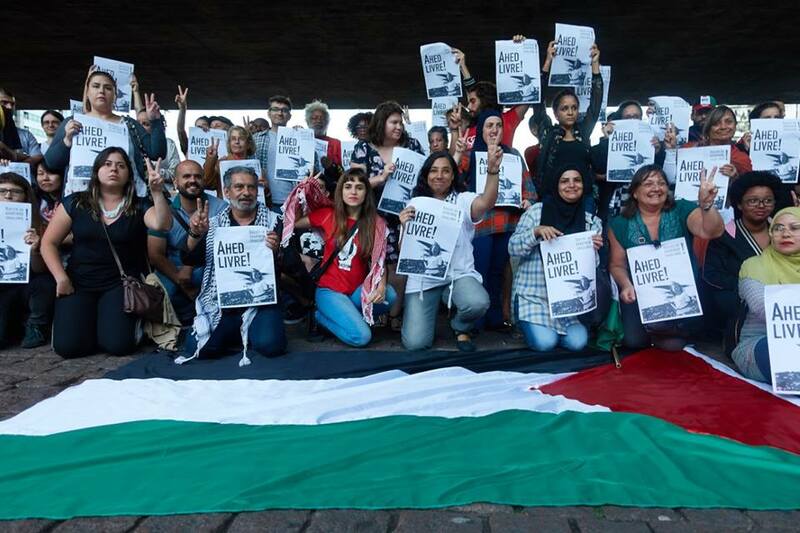 BDS Brazil and Palestinian community organizations in Sao Paulo organized a protest and gathering to call for freedom for Ahed Tamimi and other Palestinian prisoners in Israeli prisons on 31 January. 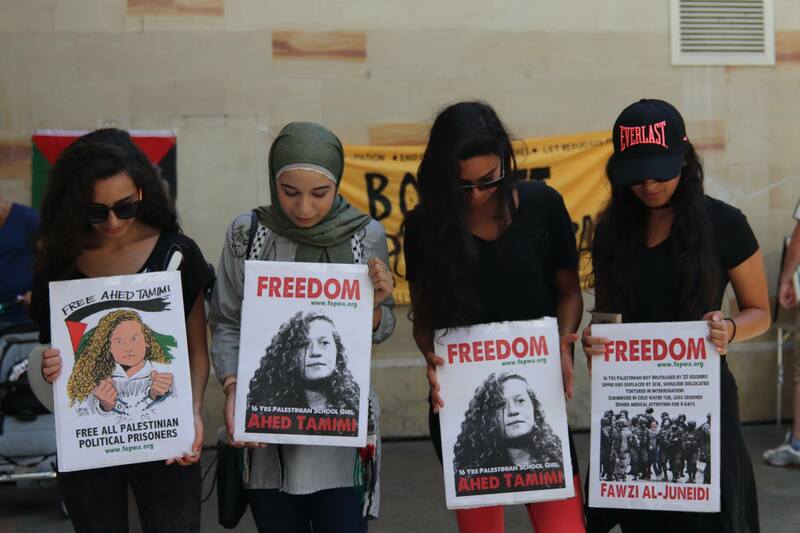 Participants spoke, chanted and held signs demanding Ahed’s immediate release. 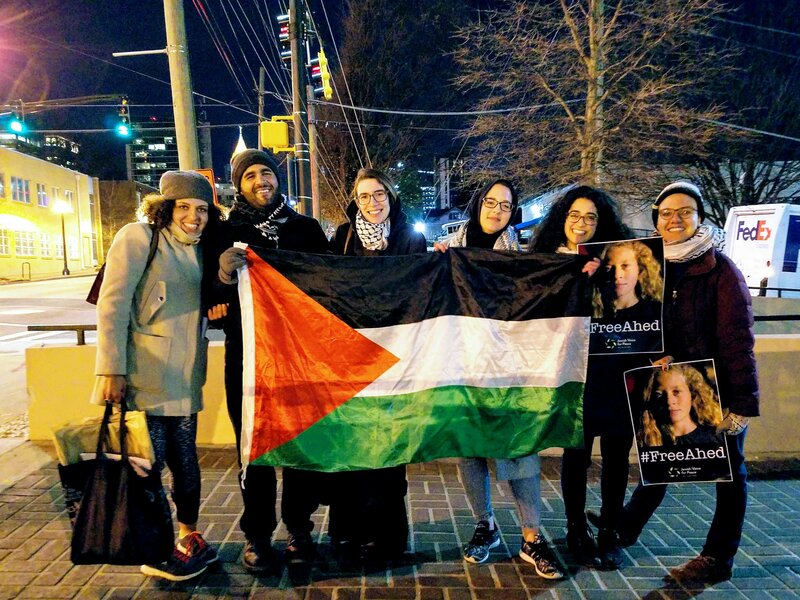 Organizers with the Jacksonville Palestine Solidarity Network and other local activists gathered collective and individual photos at various locations in the city expressing solidarity with Ahed and demanding her immediate release as she turned 17 inside Israeli prison. 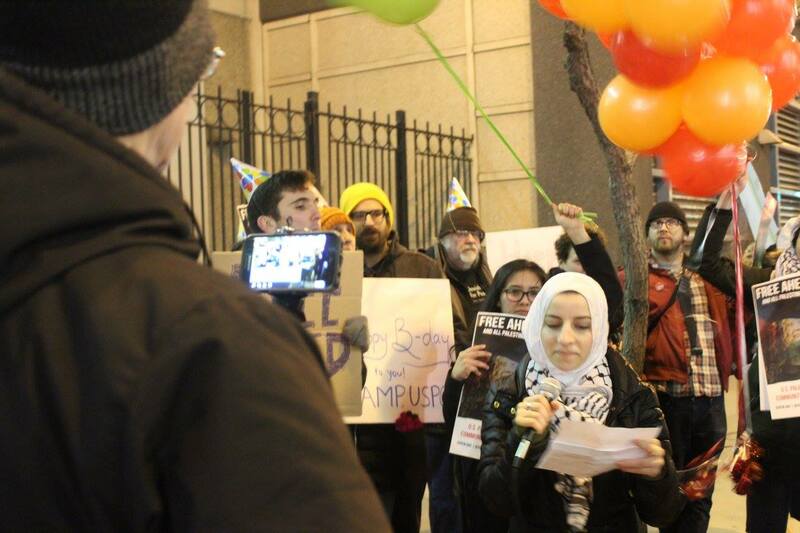 Organizers with the US Palestinian Community Network, American Muslims for Palestine, Jewish Voice for Peace and other organizations gathered on 31 January outside the Ogilvie Transportation Center for a large and spirited demonstration. 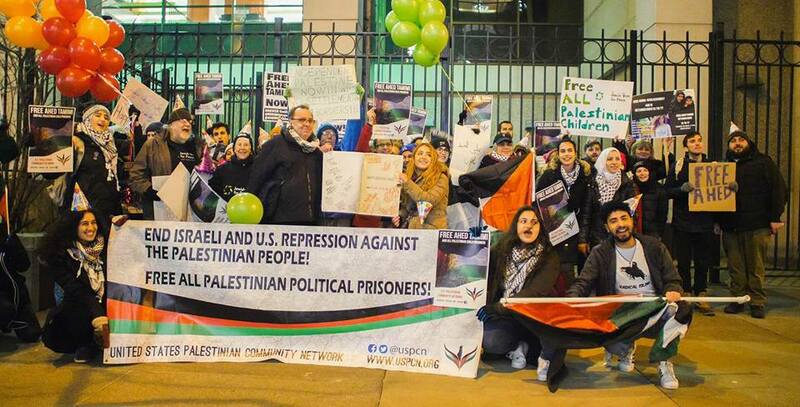 Participants from an array of social justice movements joined the demonstration demanding Ahed’s freedom and that of all Palestinian prisoners held in Israeli jails. 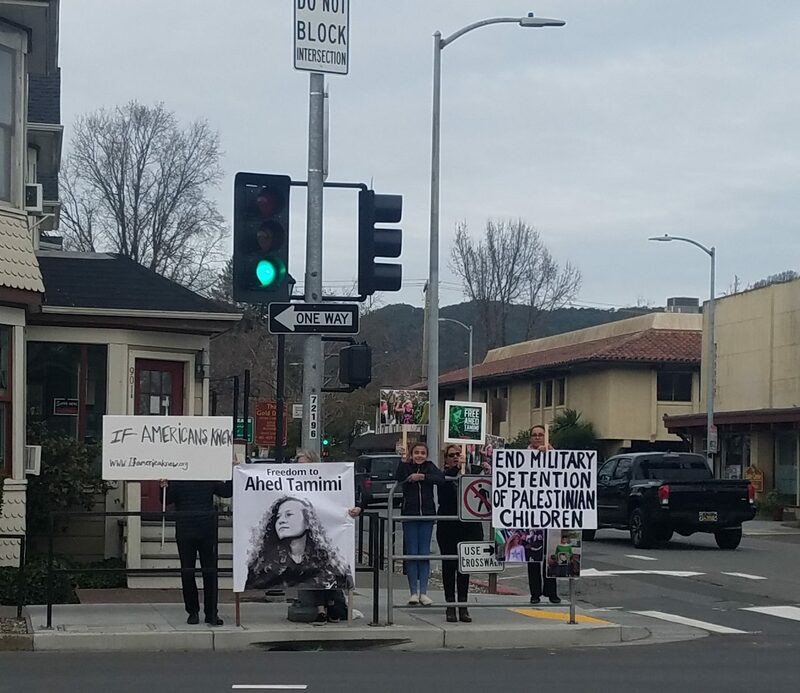 A broad coalition of organizations in Oakland organized a protest action on 31 January that marked Ahed Tamimi’s birthday. 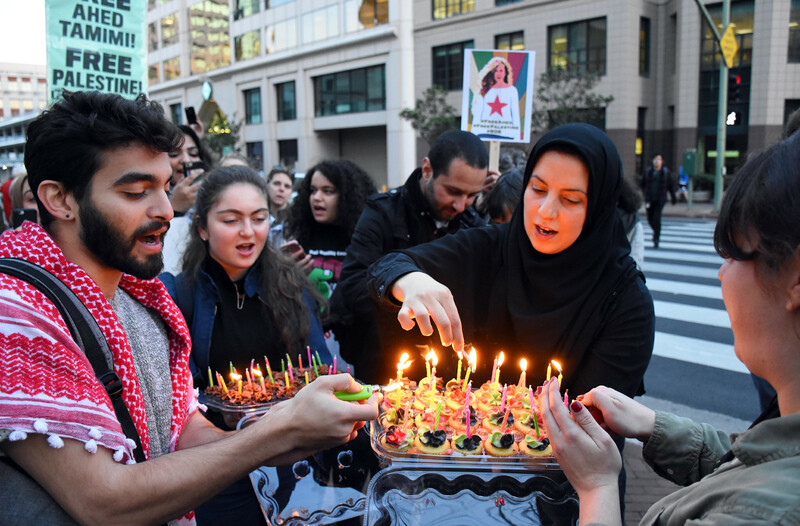 Participants distributed birthday cakes for Ahed as well as protesting and speaking, as participants from a range of justice movements joined in the protest and march. 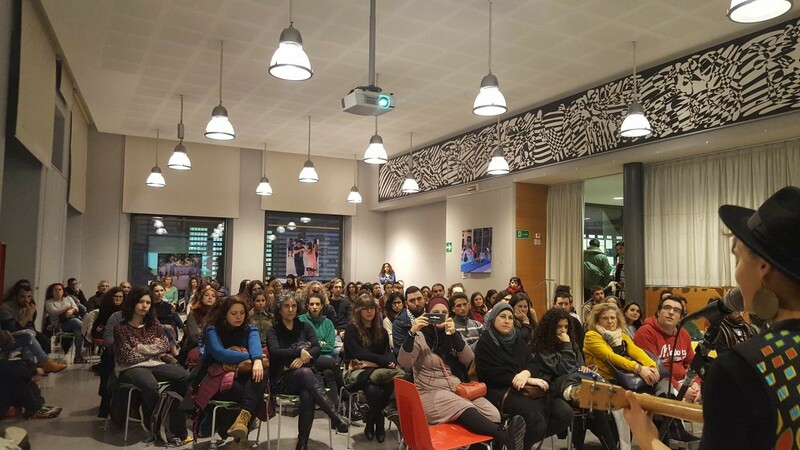 The outdoor action was followed by a gathering in Reem’s bakery, in which participants spoke about Palestinian prisoners and collected letters of solidarity to Ahed. 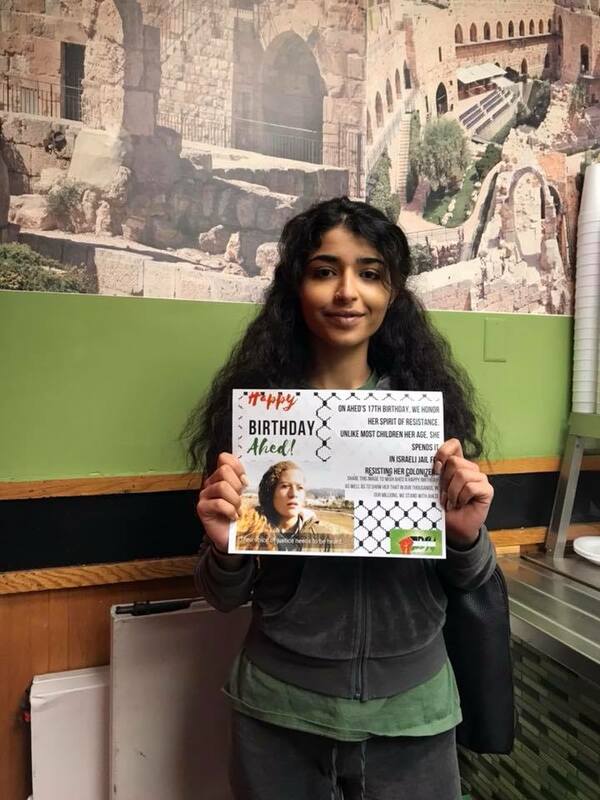 Marking Ahed’s birthday on 31 January, Jewish high school students organized an initiative with IfNotNow to deliver cards and birthday letters to Ahed Tamimi to Israeli consulates in major U.S. cities, including Boston, New York and Washington. 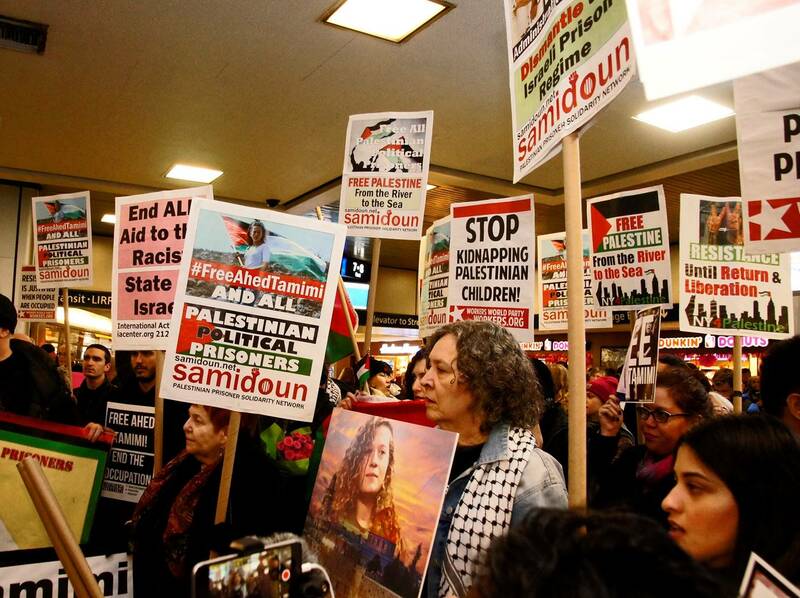 On 28 January, the Party for Socialism and Liberation in Portland, Oregon screened films about Ahed Tamimi and Palestine as part of the days of action. 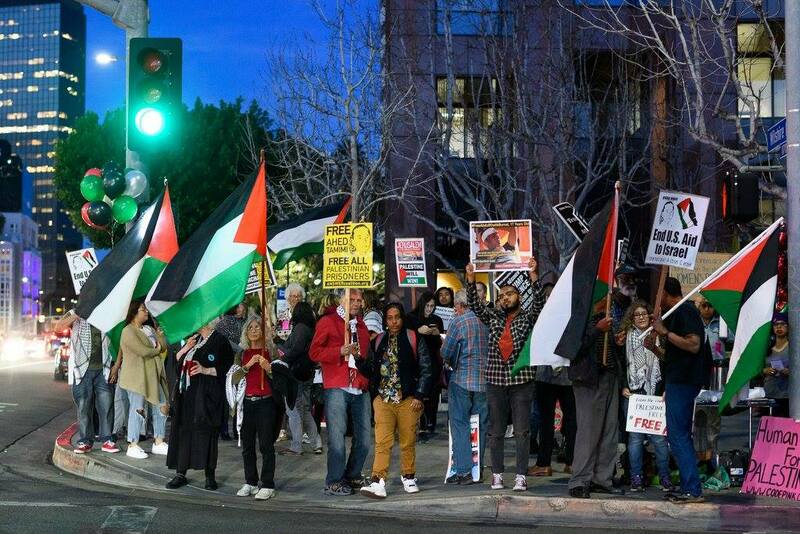 In addition, on 29 January, activists in San Jose, California, joined the protests, holding an action near Cesar Chavez Park. 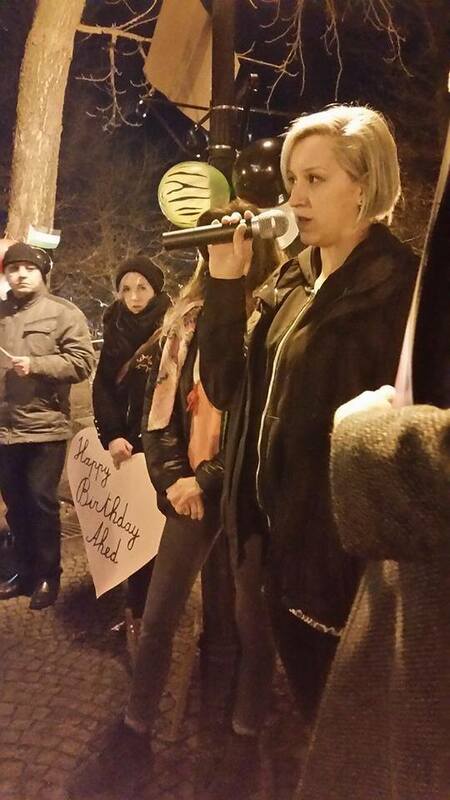 In Boston, MA, writing letters to Ahed was also part of the monthly meeting of Jewish Voice for Peace. 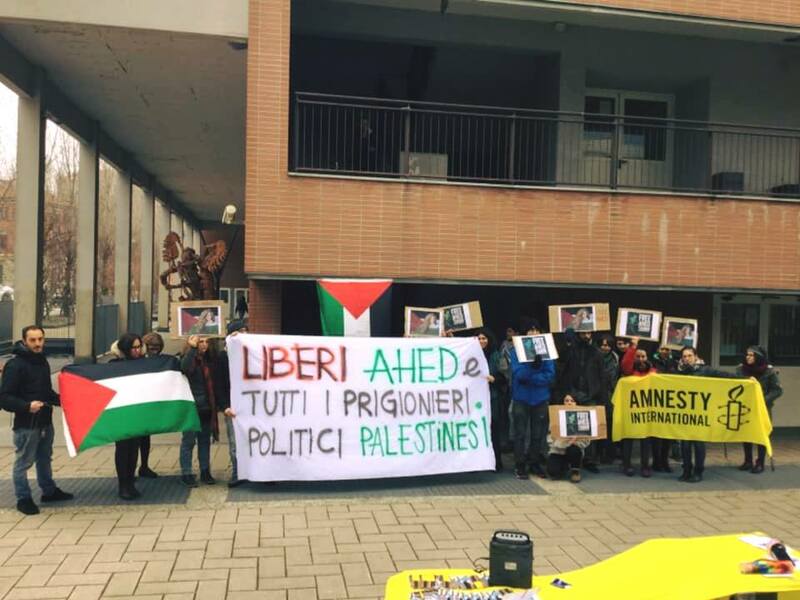 Cleveland, Ohio and Oxford, Mississippi were home to protests for Ahed’s release on 30 January as part of the International Day of Action. 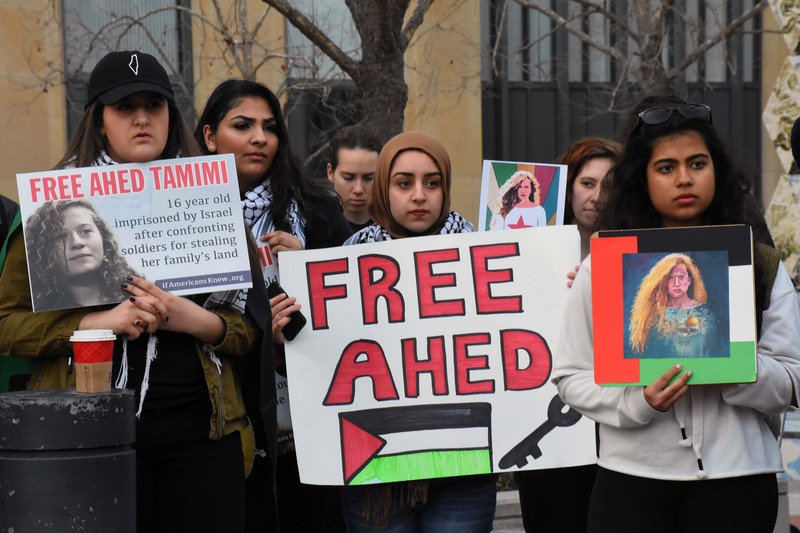 In Regina, Saskatchewan and Ottawa, Ontario, Canadian protesters urged Ahed’s freedom and called for a change in Canadian government policy to support Palestinian rights. 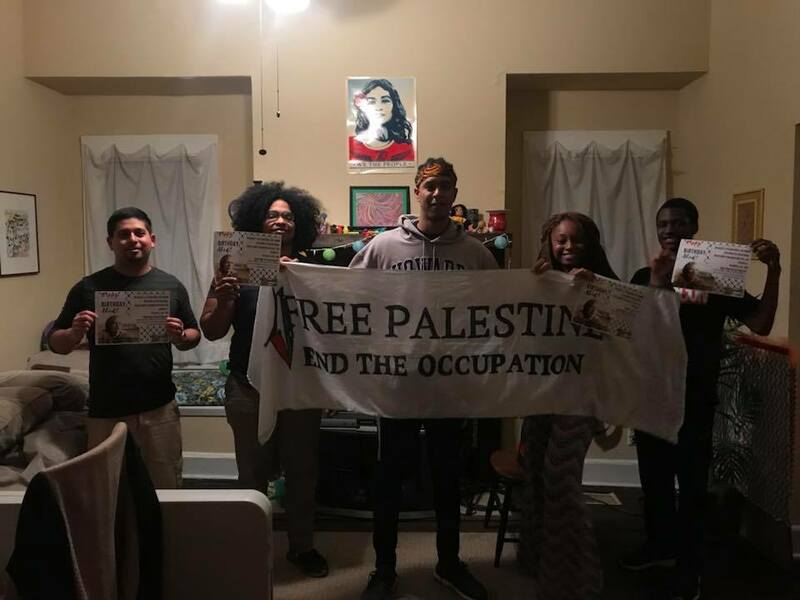 At Eastern Michigan University in Ypsilanti, Students for Justice in Palestine organized a teach-in where participants wrote letters to Ahed to be mailed to her Israeli prison. 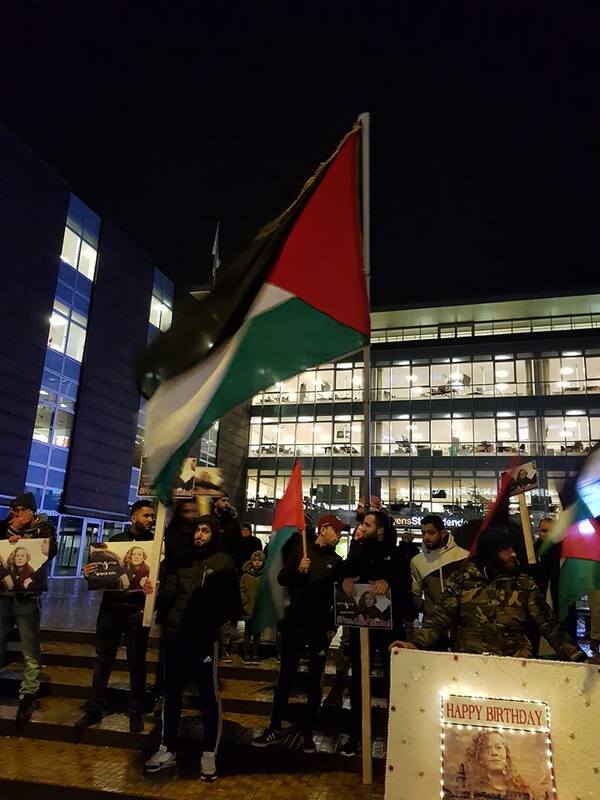 In Bristol, UK, activists with the Palestine Solidarity Campaign screened a film in support of the campaign for Ahed’s freedom on 29 January. 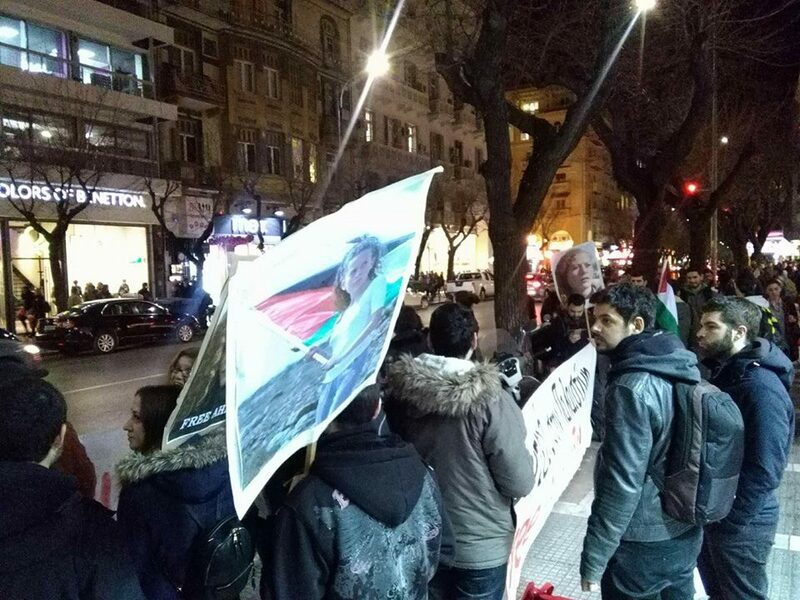 On 31 January, activists in Mexico City, Santiago, Chile and Rio de Janeiro, Brazil organized demonstrations to free Ahed and all Palestinian prisoners.